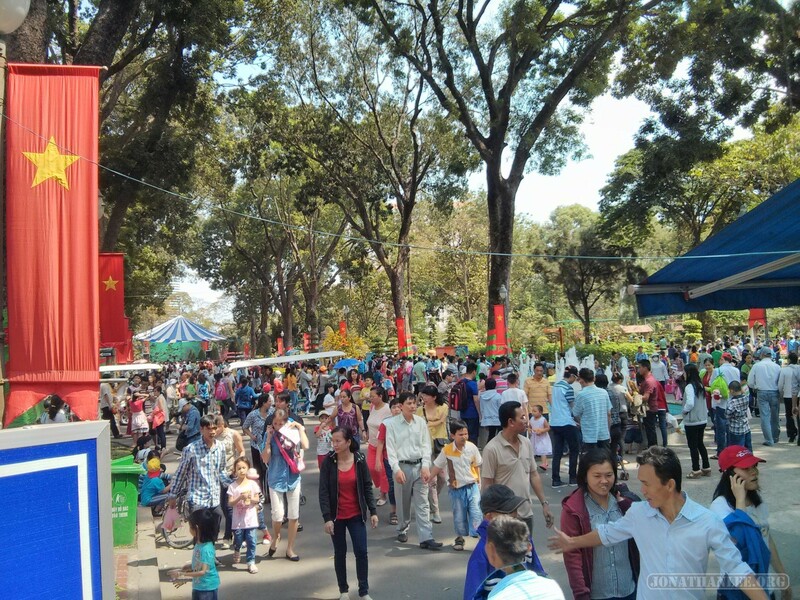 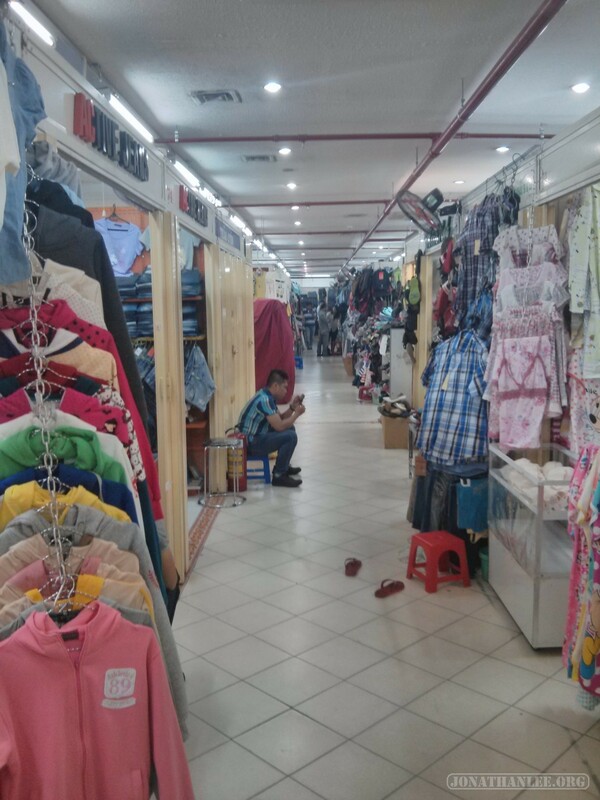 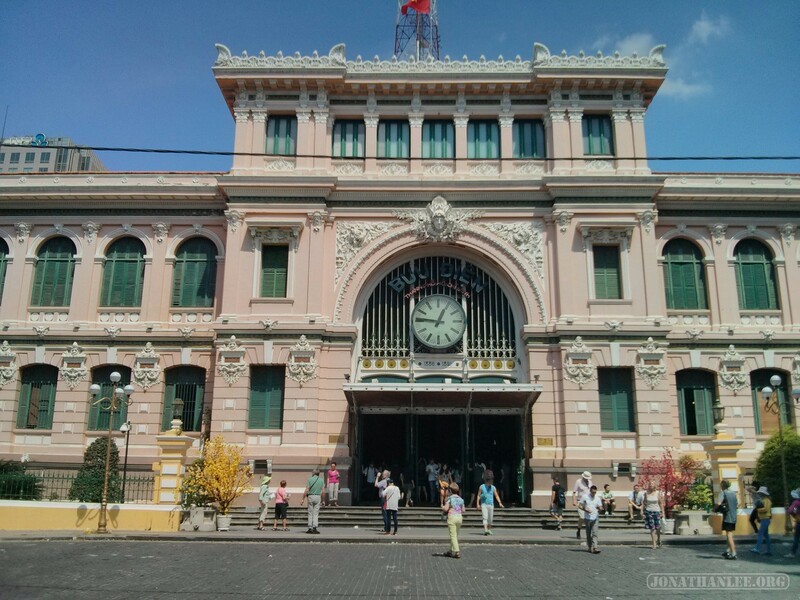 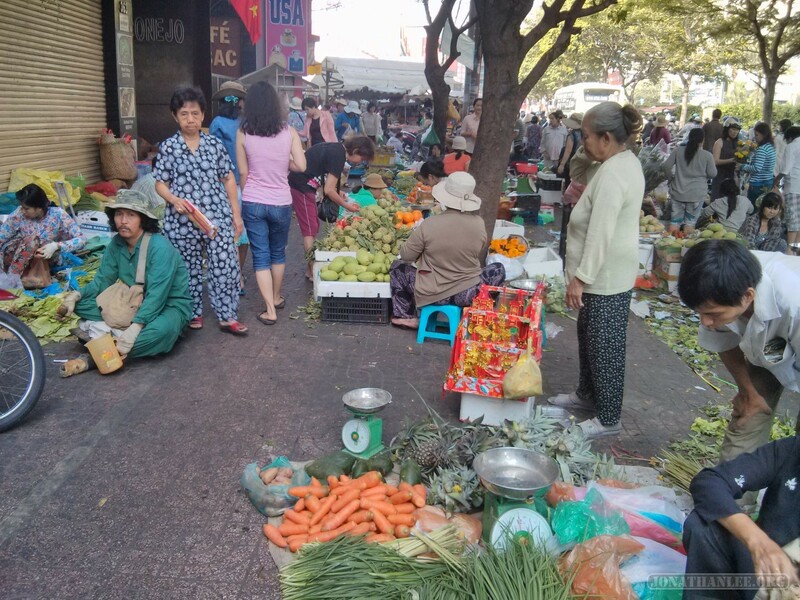 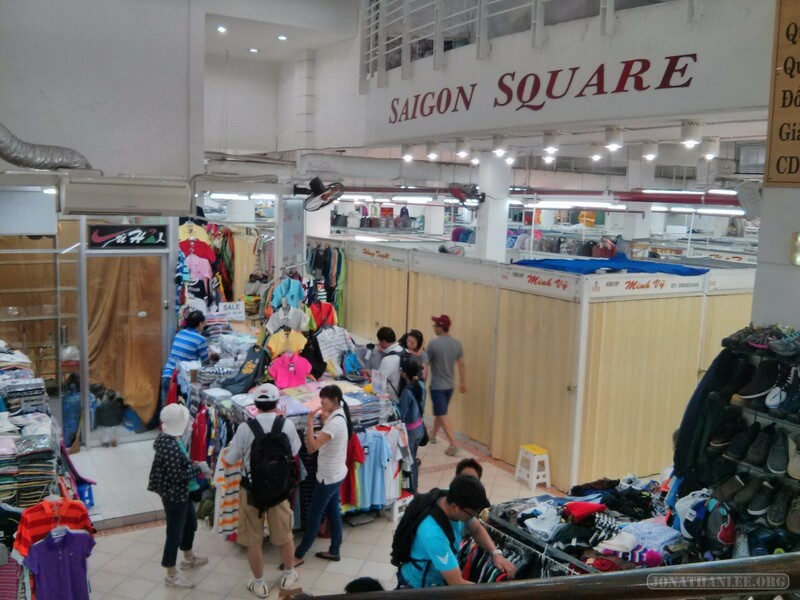 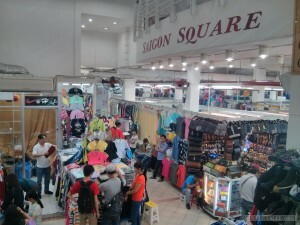 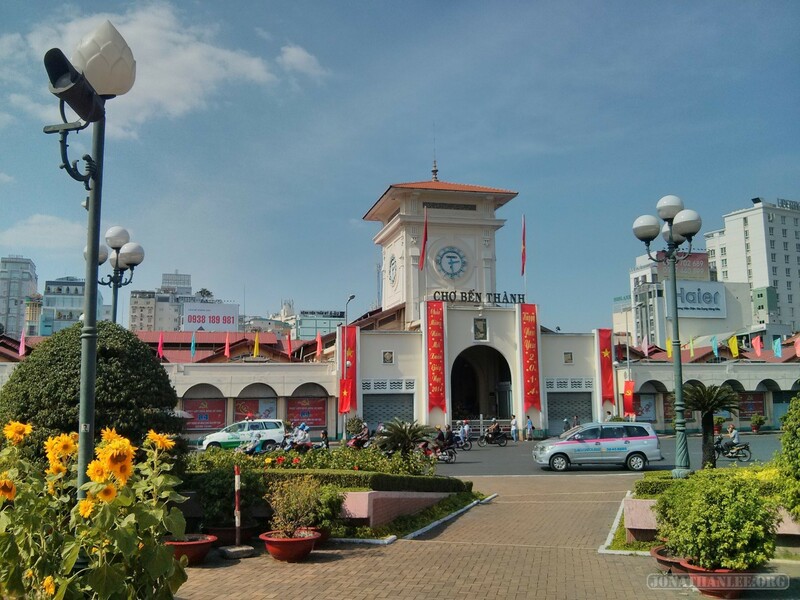 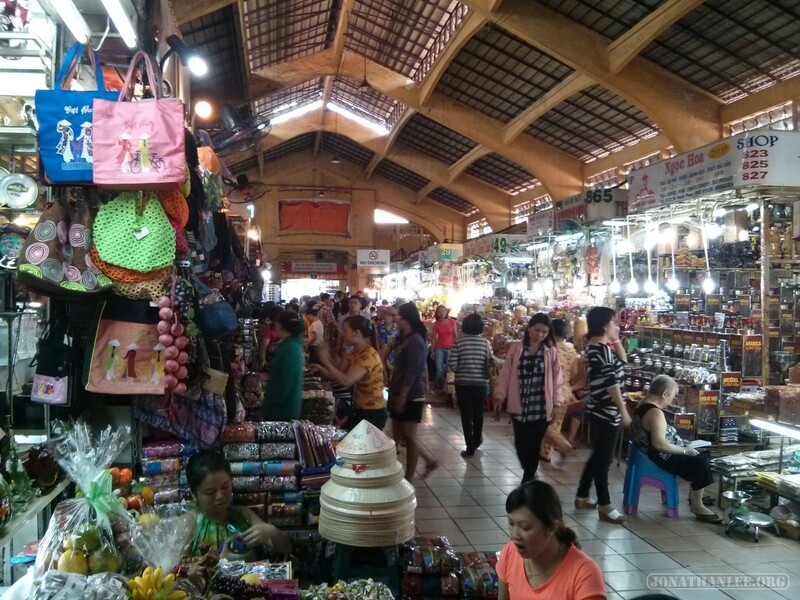 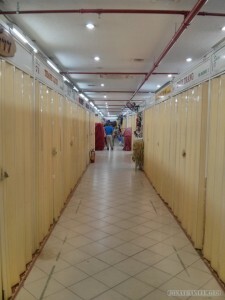 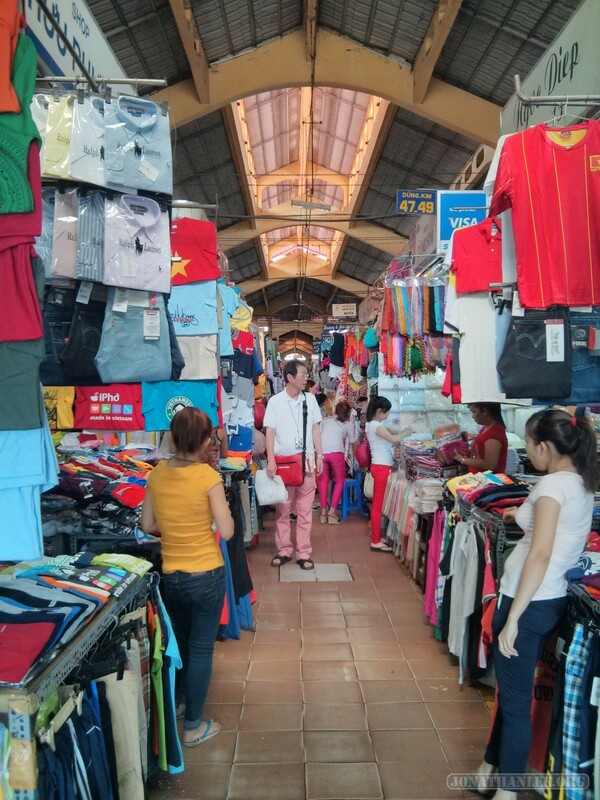 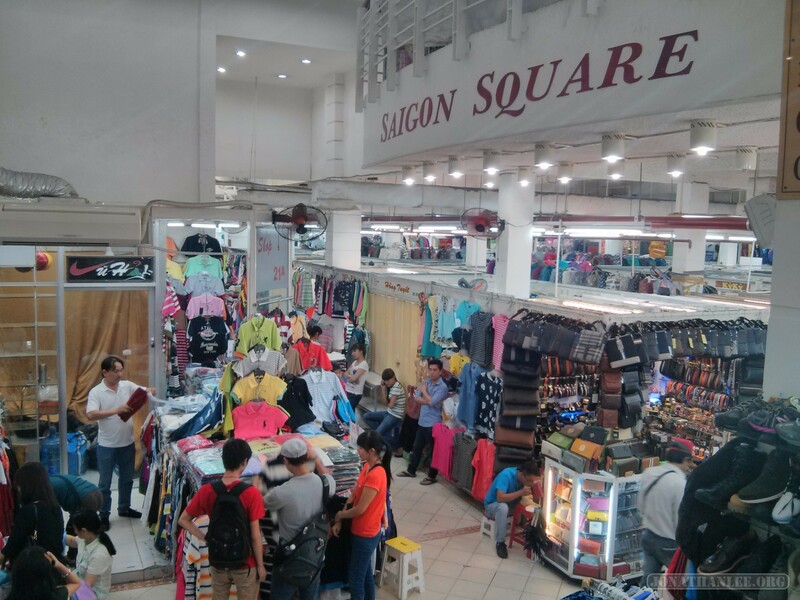 Ben Thanh Market: a giant market, aimed primarily at tourists. 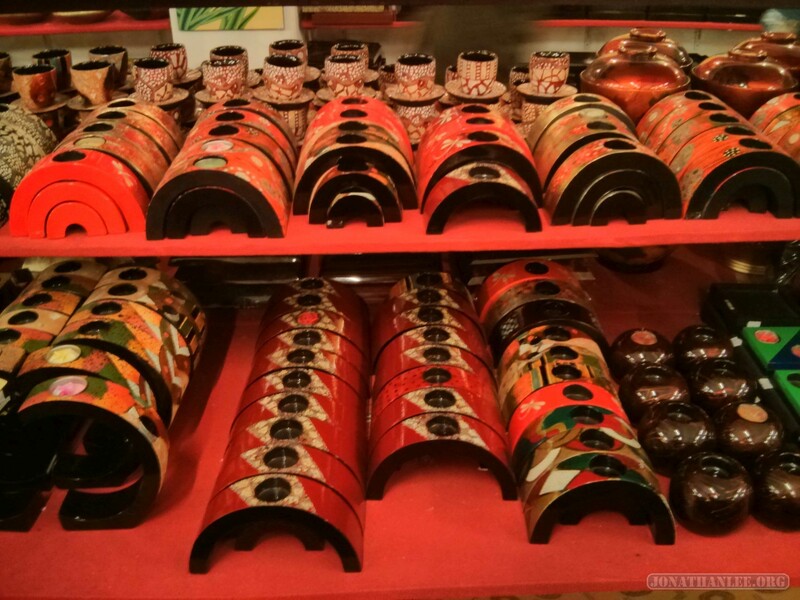 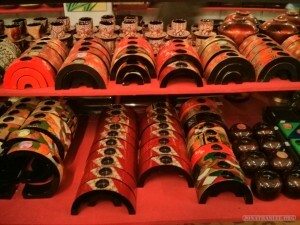 All items are twice the prices they should be, even after haggling. 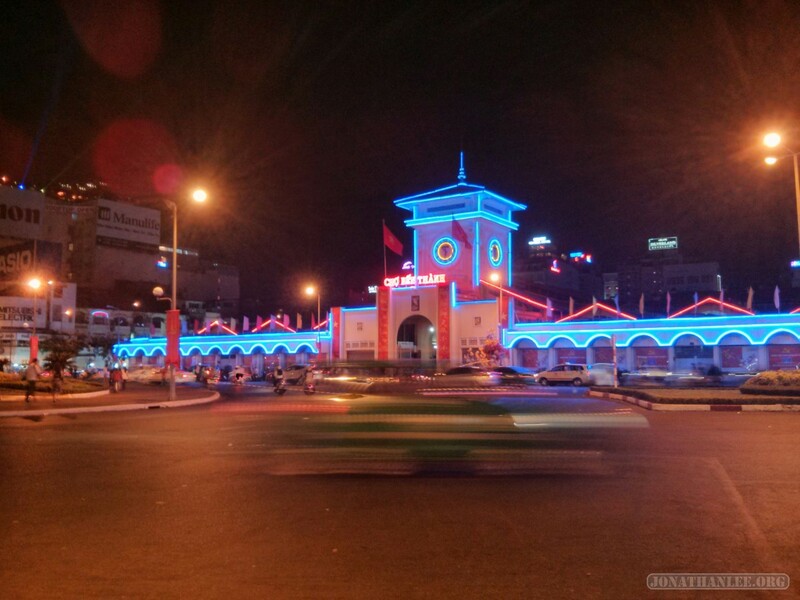 Nice lights display at night though! 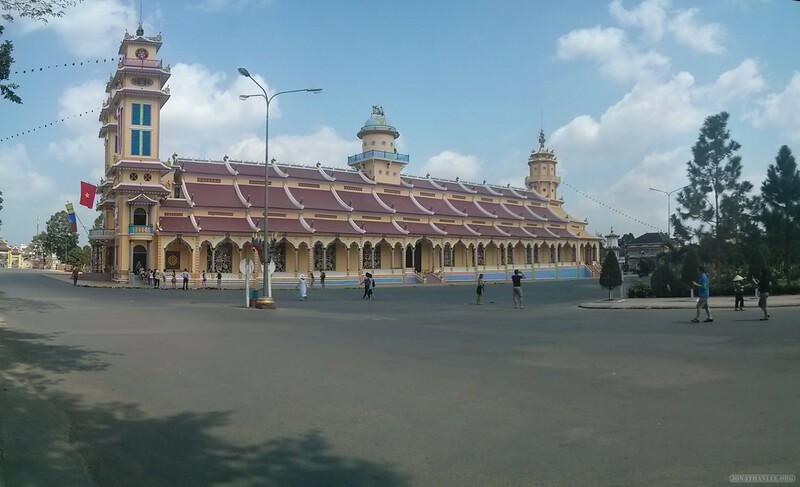 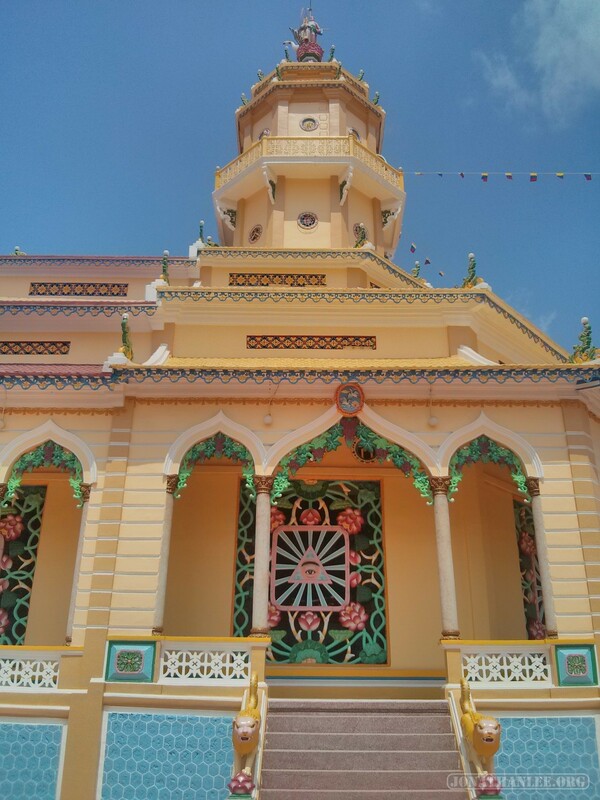 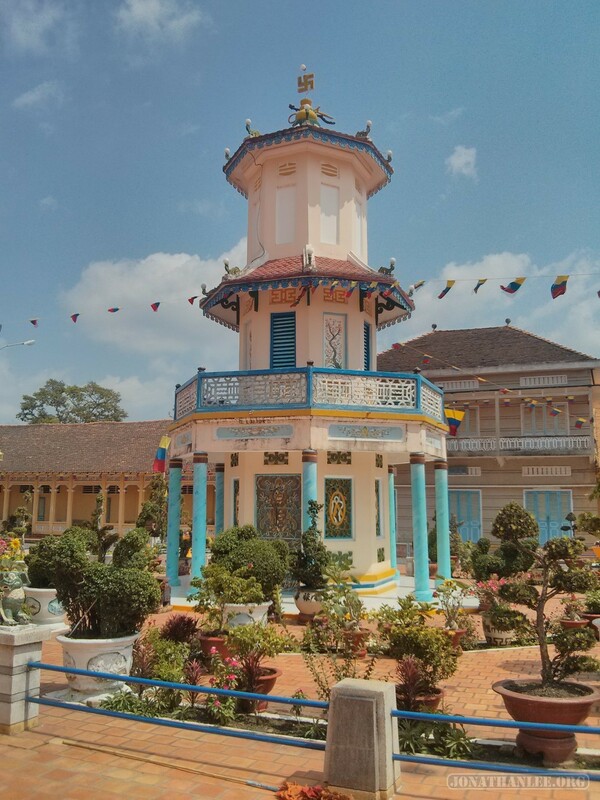 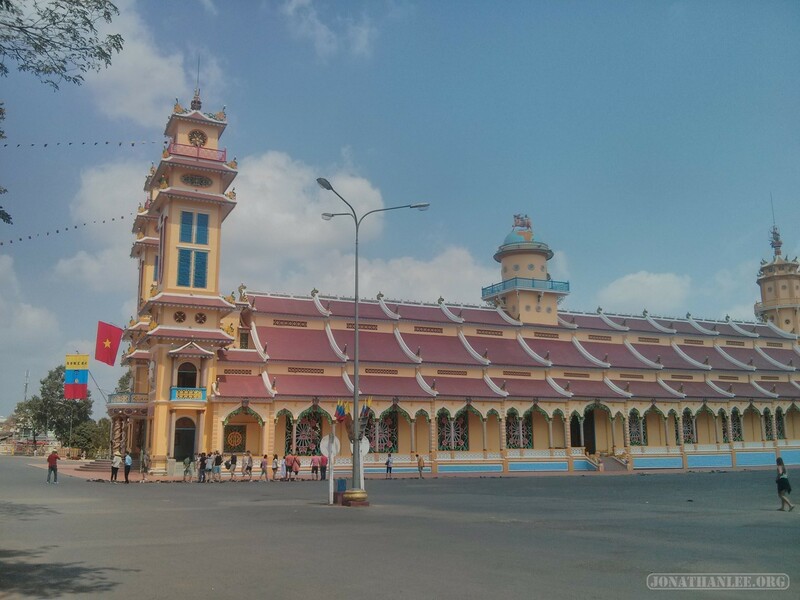 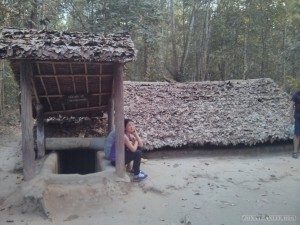 During my time in Saigon, I went on a day trip tour, to the Cao Dai Temple and the Cu Chi Tunnels. 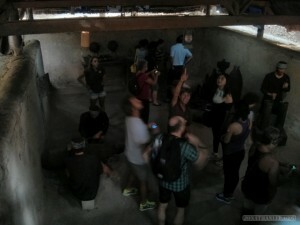 It was horrible, and I resolved to never again go sightseeing with a tour group. 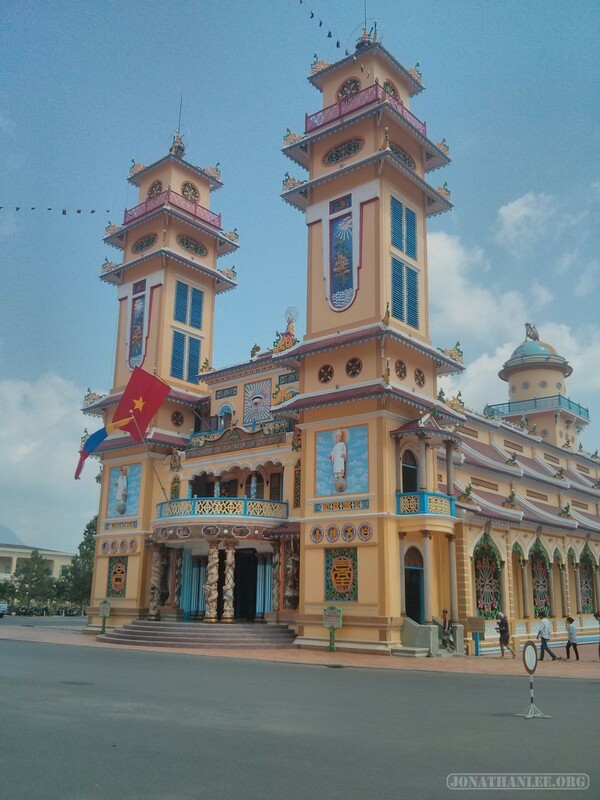 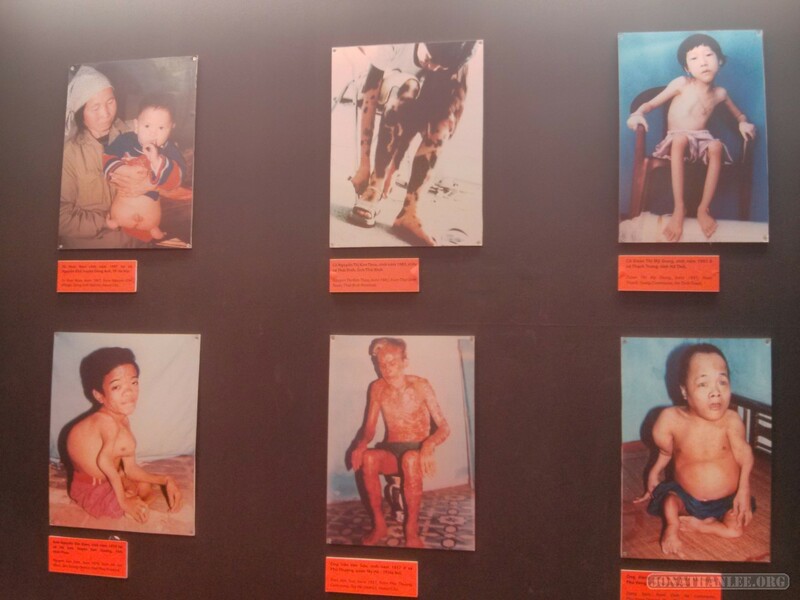 Of the nine hours spent with the tour group (a full day tour to the Cao Dai Temple and Cu Chi Temples), half an hour was spent at Cao Dai, an hour was spent at Cu Chi, an hour was spent at lunch, and half an hour was spent at a lacquer shop “for Agent Orange victims”. The rest was spent on the bus. 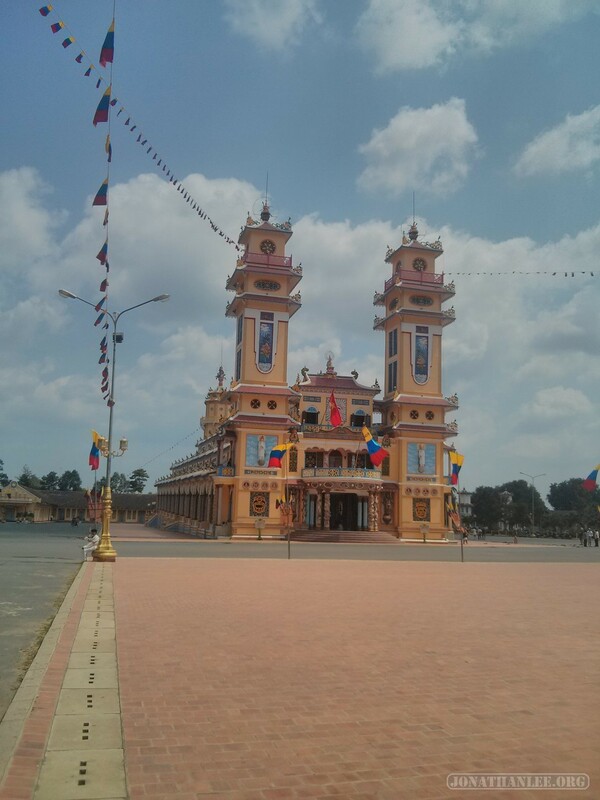 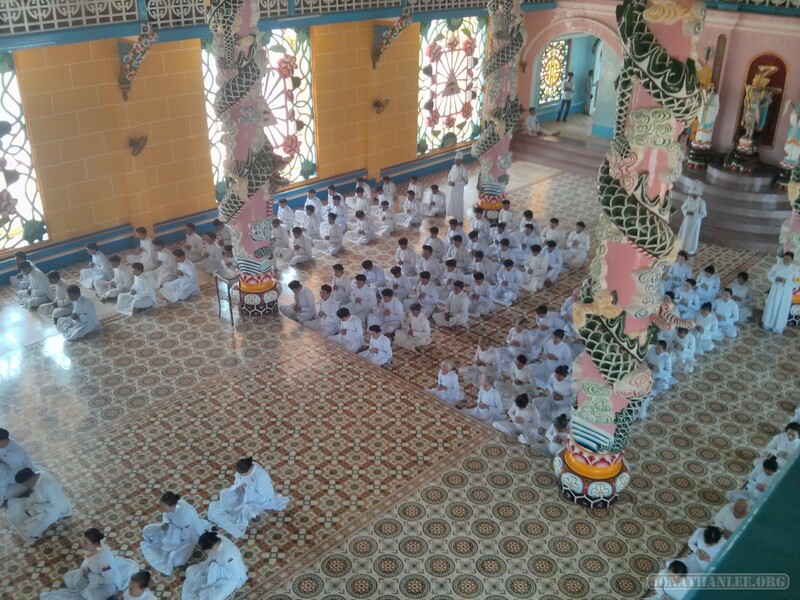 Cao Dai Temple: architecturally interesting (it’s like an oriental Notre Dame). 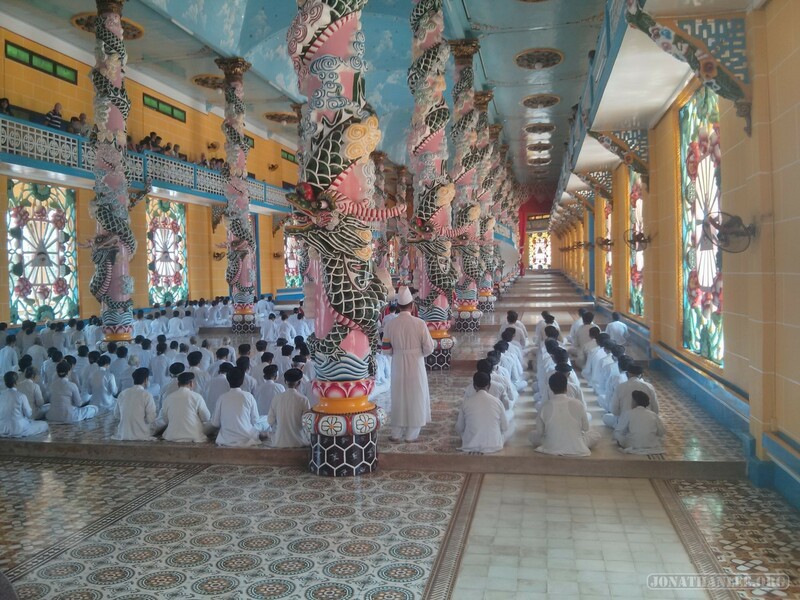 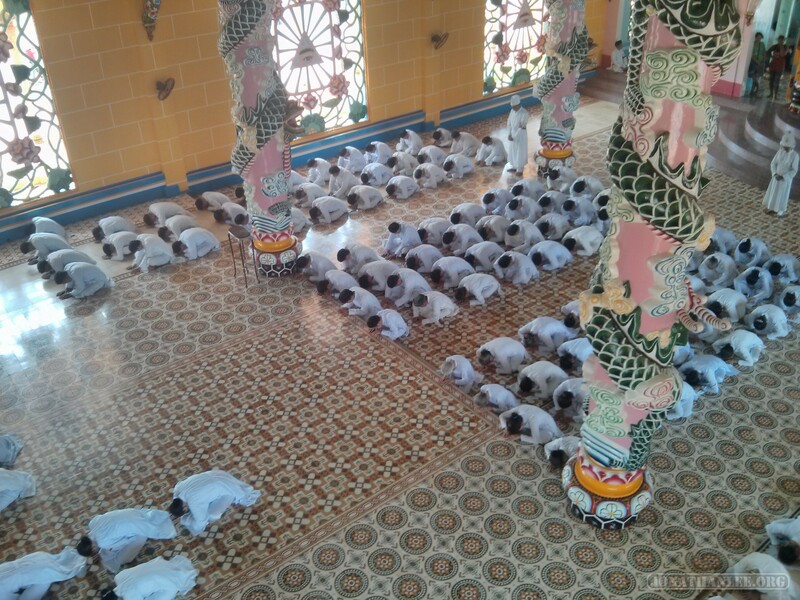 Filled with cultists (seriously, Cao Dai is a cult). 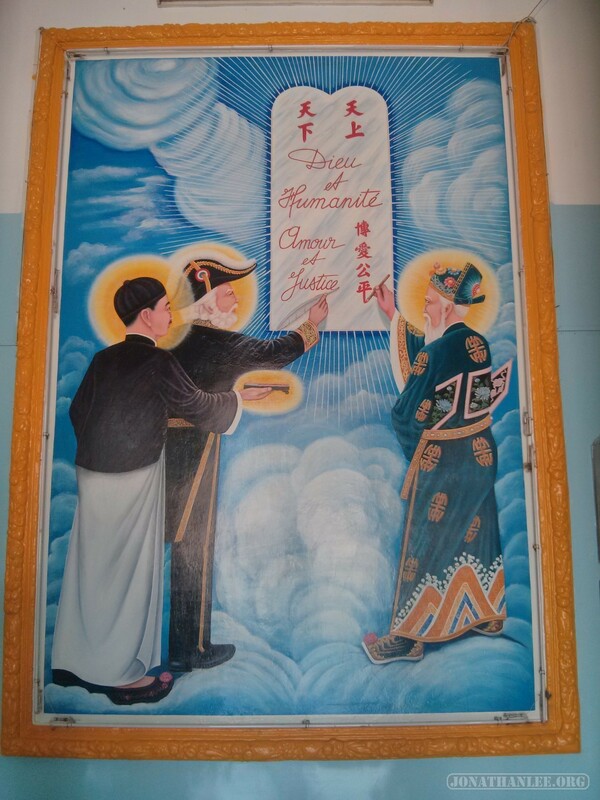 Interestingly, they consider Sun Yat-Sen, the founding father of modern China, as one of the saints of Cao Dai. 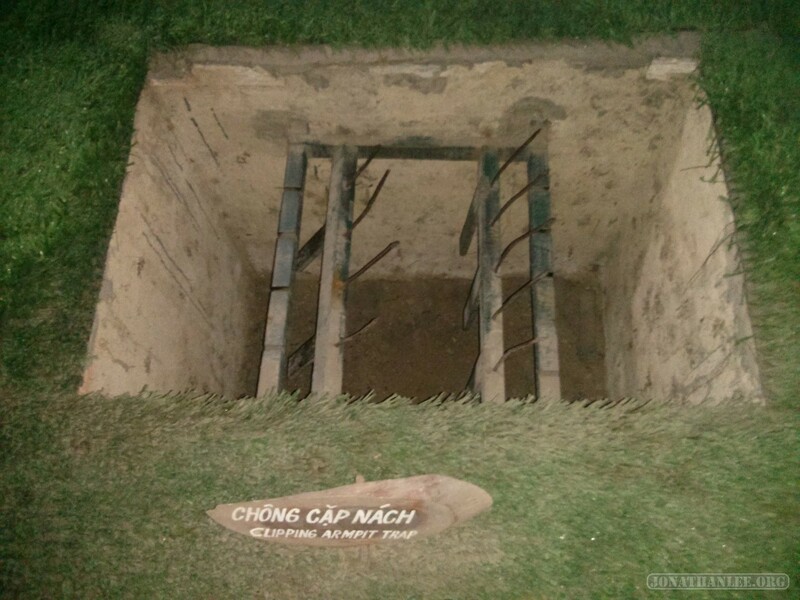 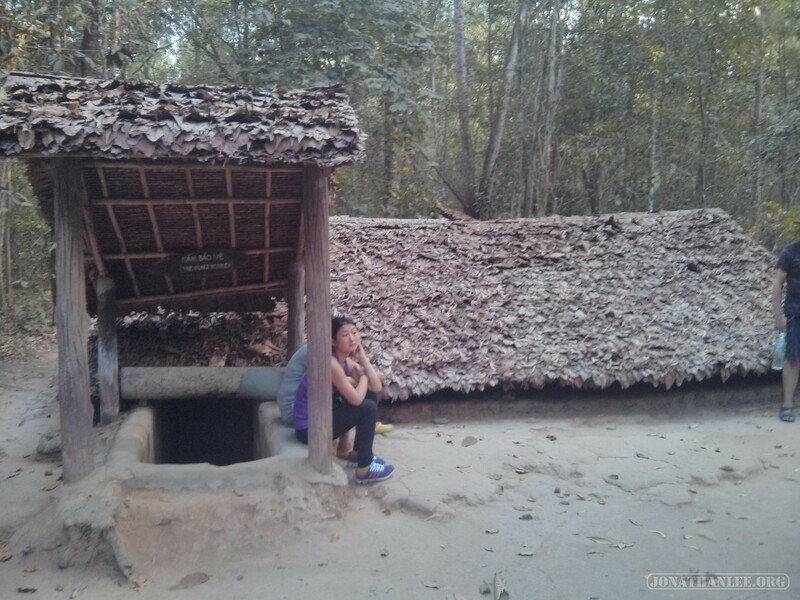 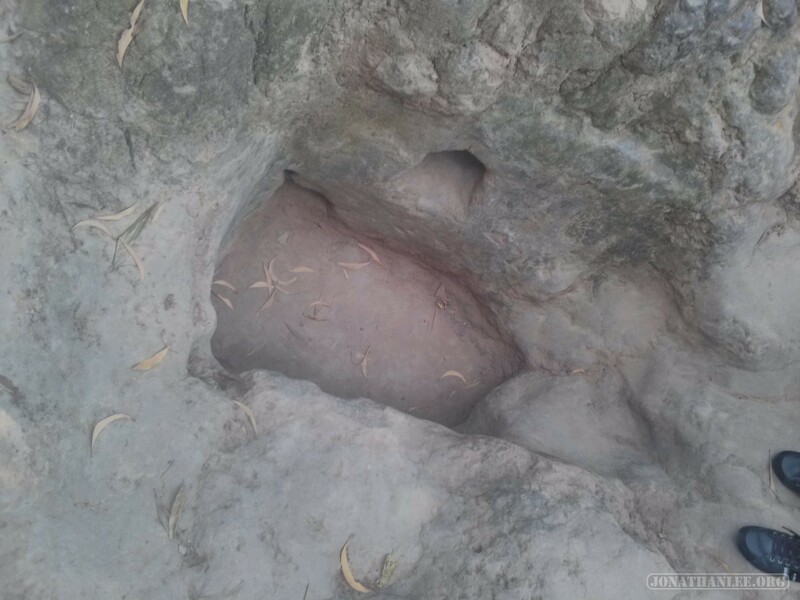 Cu Chi Tunnels: supposedly, a set of tunnels used by the Vietcong during the Vietnam War to evade US and south Vietnamese troops. 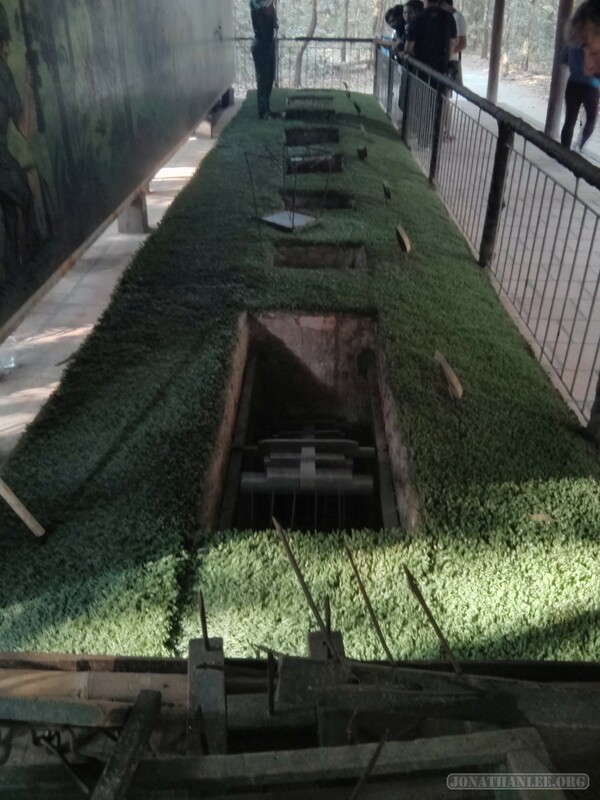 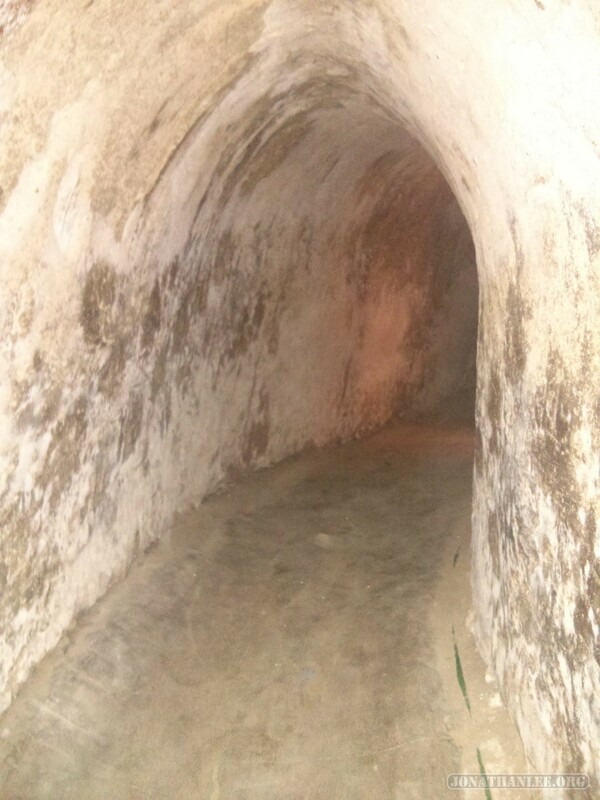 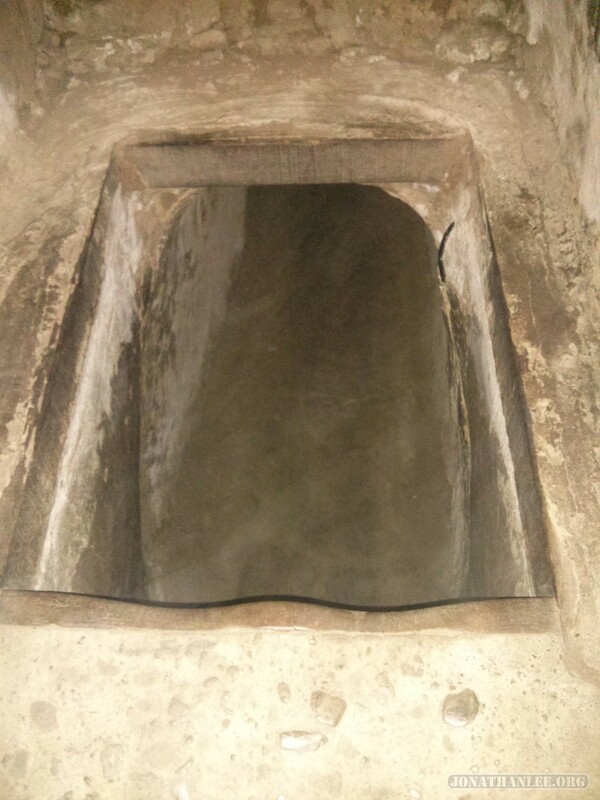 In reality, there are two sets of tunnels – Ben Duoc, a real part of the old tunnel network, but further away from Saigon and so rarely visited by tour groups, and Ben Dinh, a “fake” set of tunnels created just for tourists, frequently visited by tour groups. 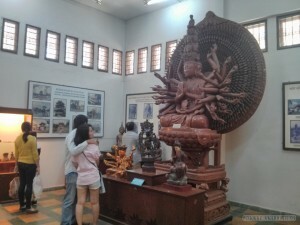 Still worth visiting, even if fake! 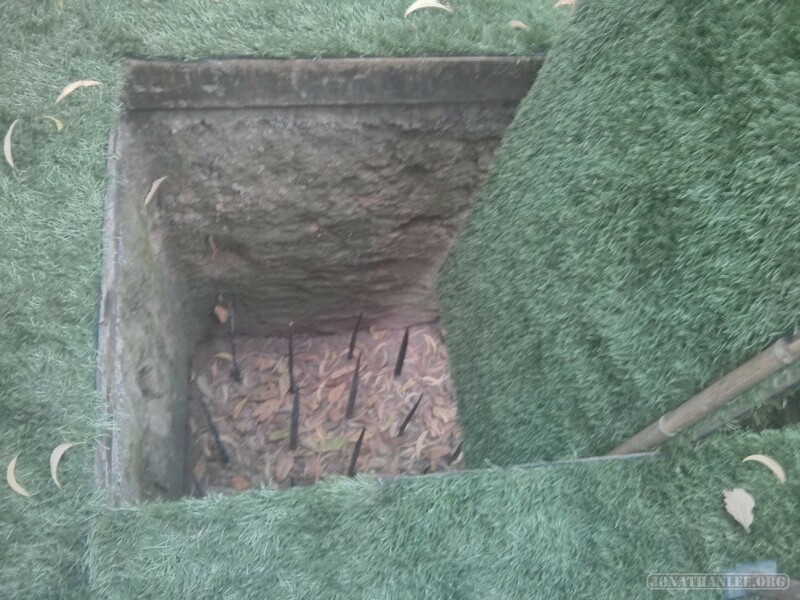 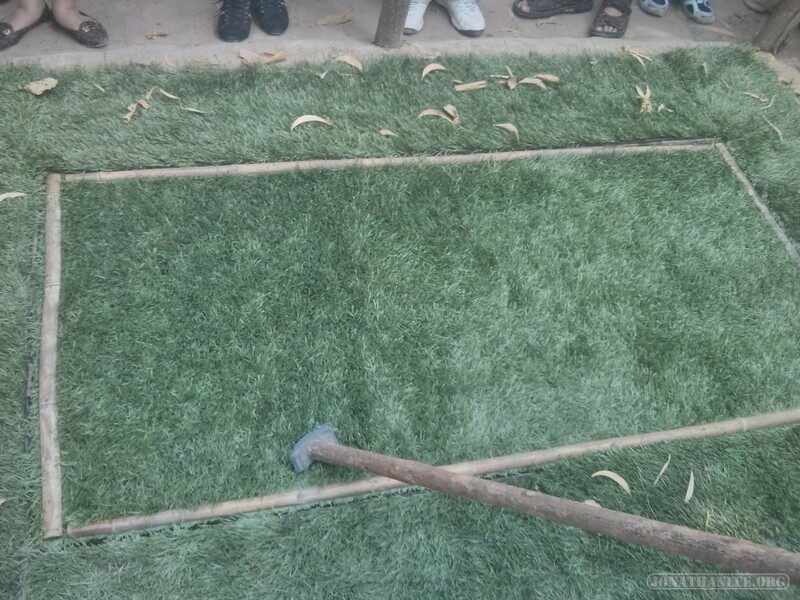 There’s a nice display of traps that the Vietcong set for American troops. 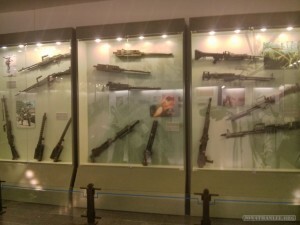 There’s a shooting range right on grounds, where you can shoot all sorts of guns, from the AK-47 to the M16 to the M60. 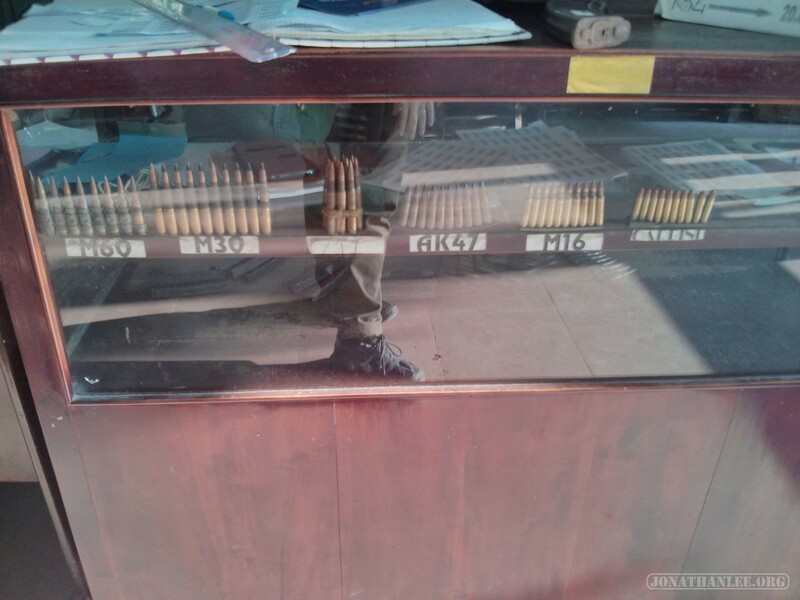 Only $1.5 PER BULLET. 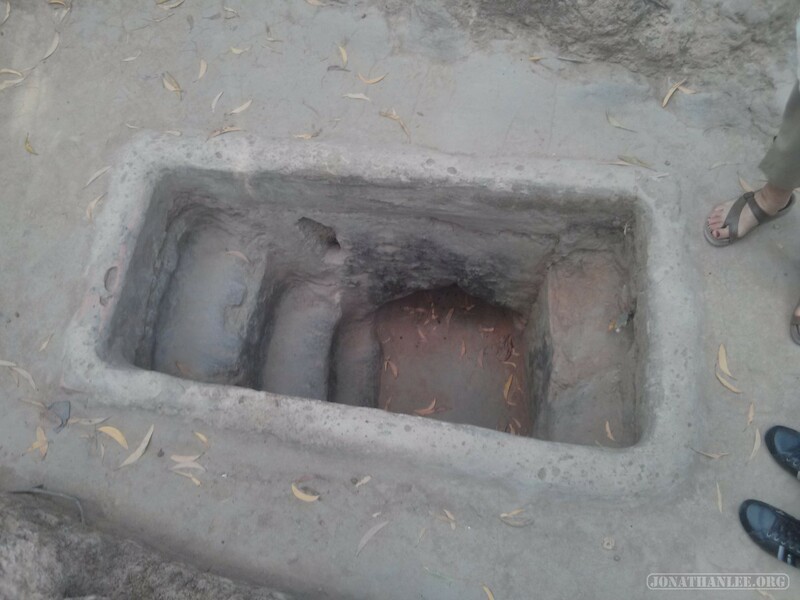 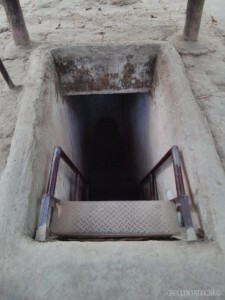 And the tunnels – they’re extremely well disguised. 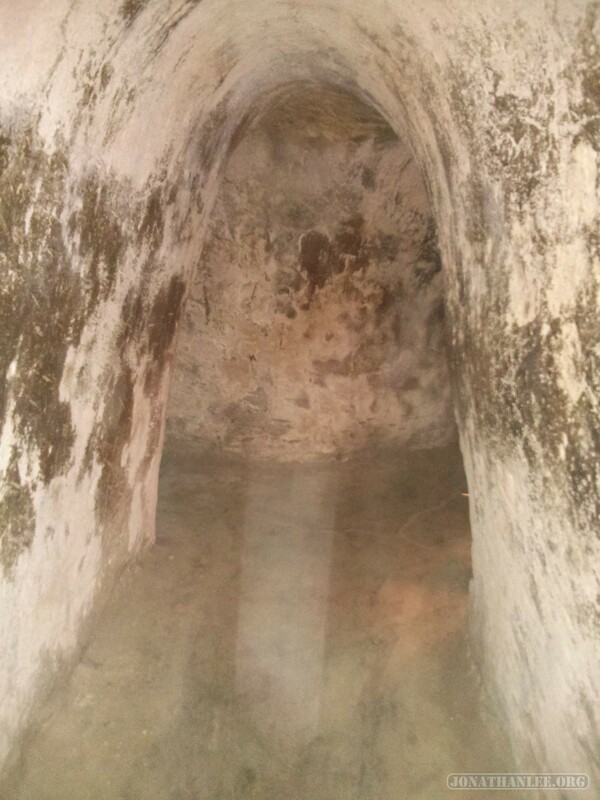 The “actual” (tourist) tunnels are almost terrifyingly claustrophobic – the entrances are okay, but they lead directly into the earth. 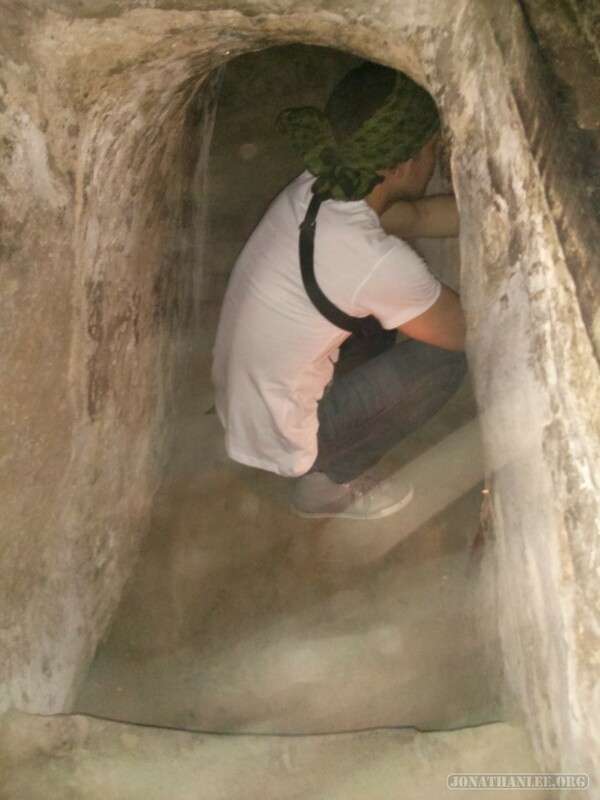 And then, there’s the actual tunnels – so small that you have to crawl through the packed dirt tunnel, hot and humid after having experienced a long line of tourists, slowly getting smaller and more claustrophobic. 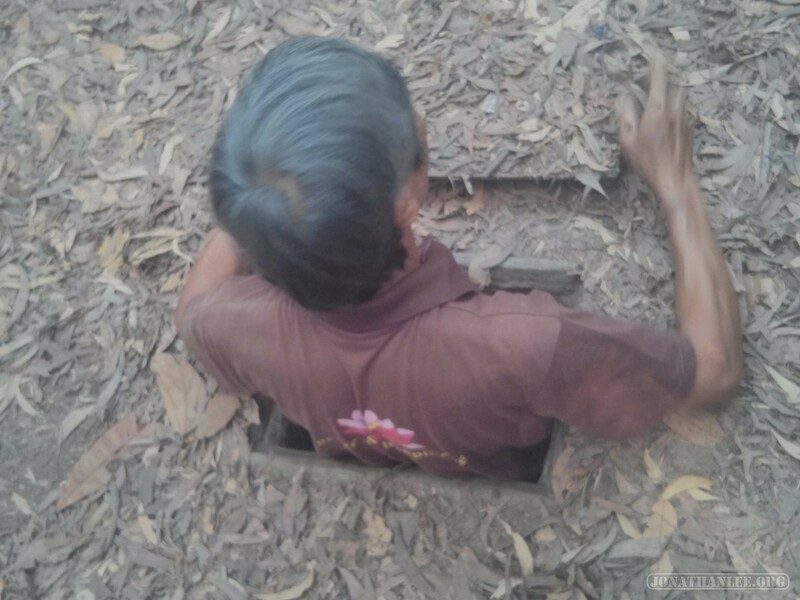 The possibility of a freak earthquake terrifies you. 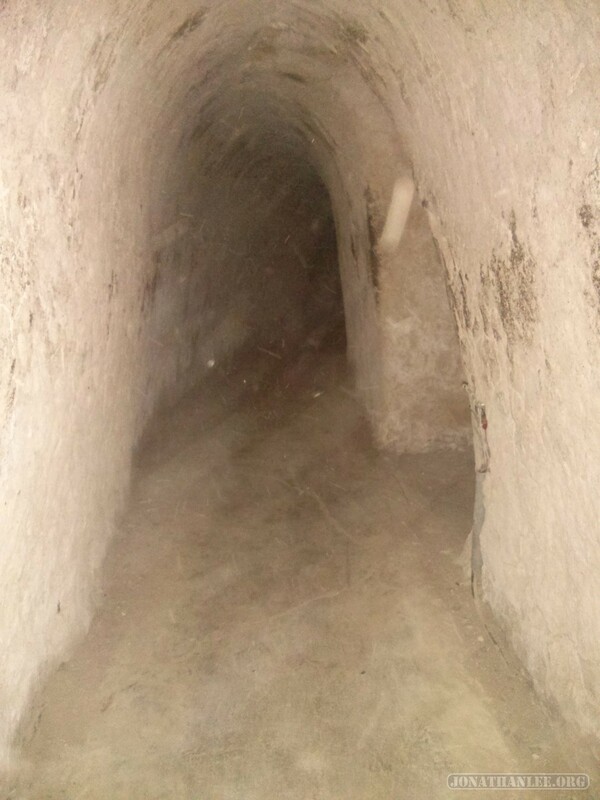 The “actual” (real) tunnels are even more terrifying – tiny holes in the ground, there’s no way I’m going in them. 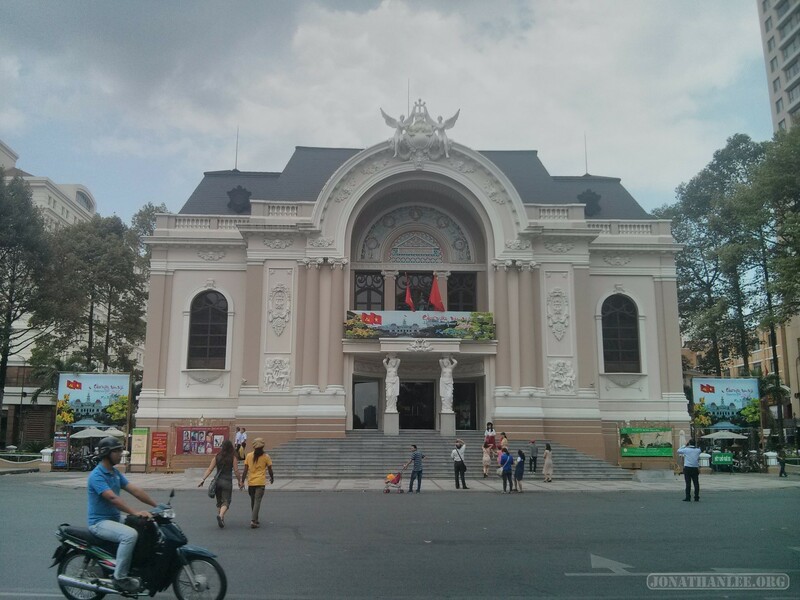 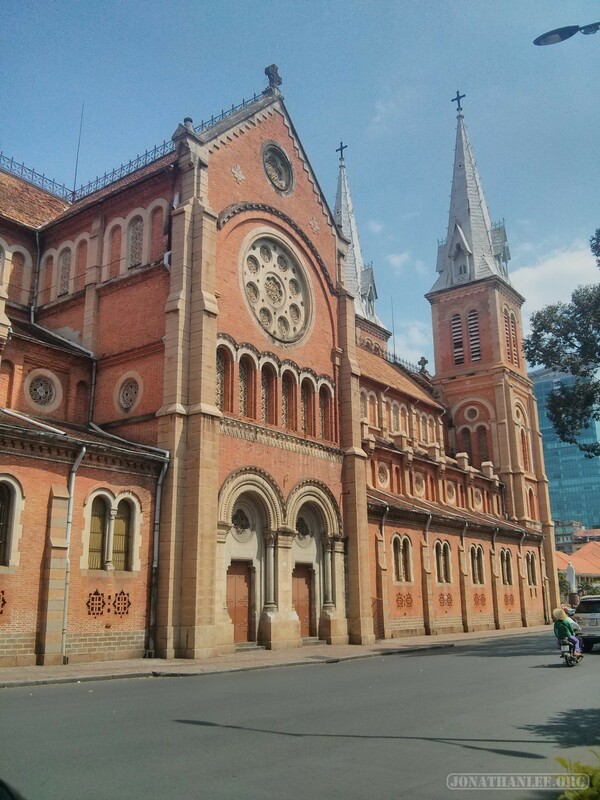 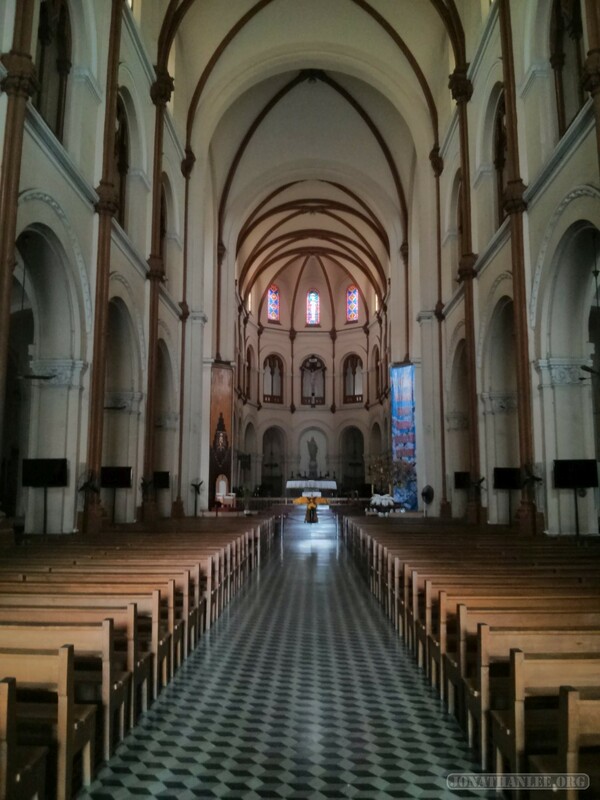 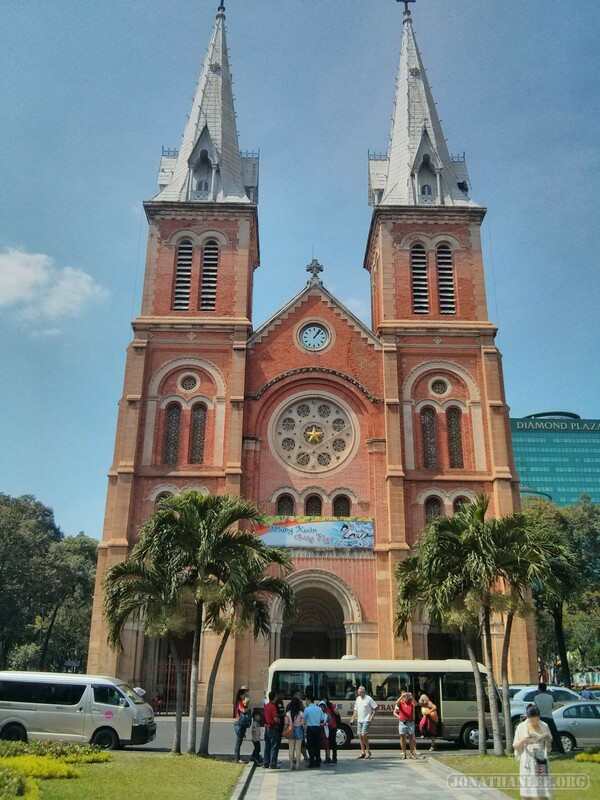 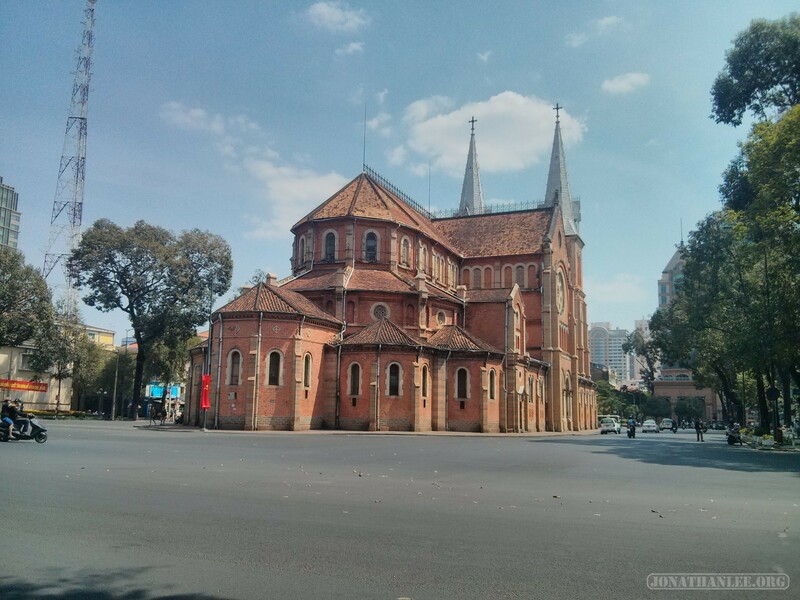 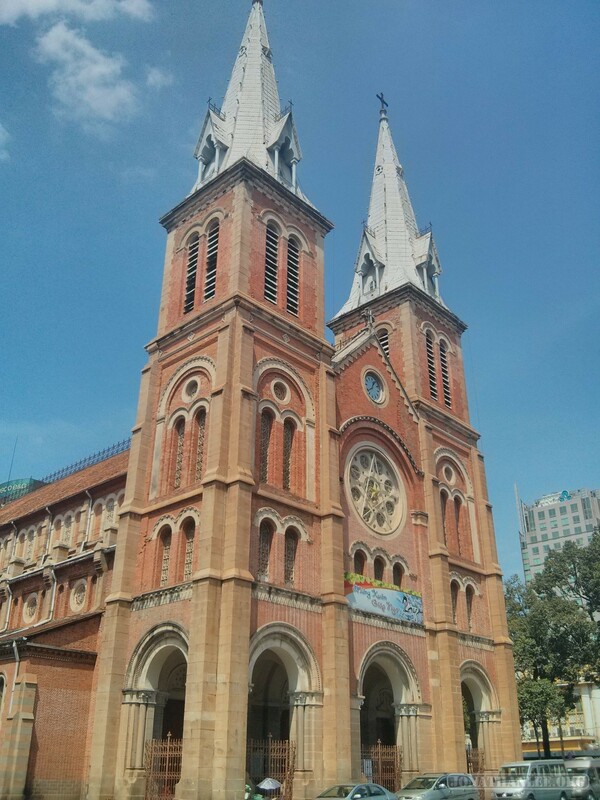 Notre Dame Cathedral: It’s the Notre Dame of Saigon. 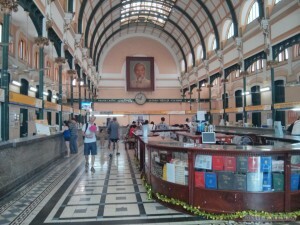 Post Office: It’s a huge French-style building, with the inside post office turned into a tourist attraction, selling all sorts of souvenirs. 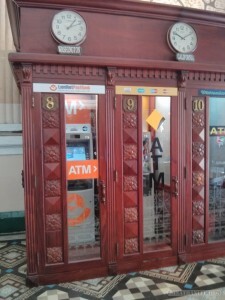 I did like how the old phone booths have been converted into ATM stations! 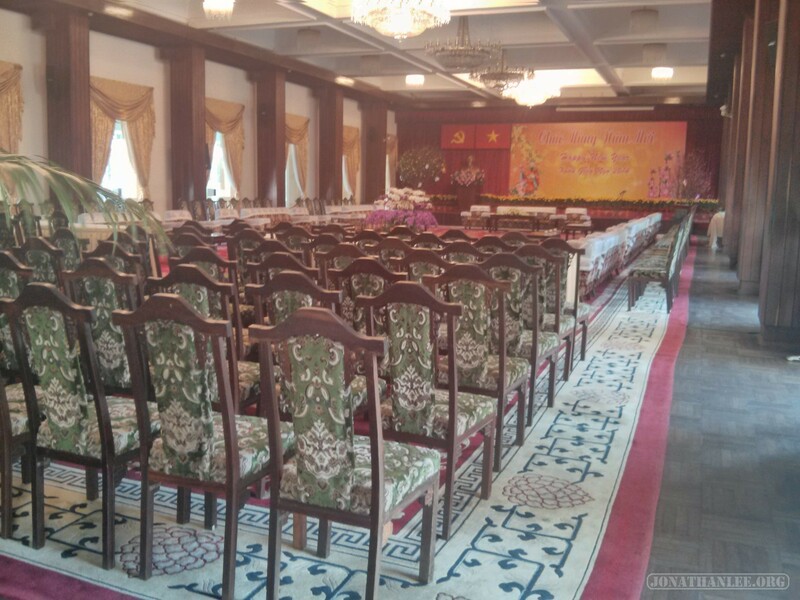 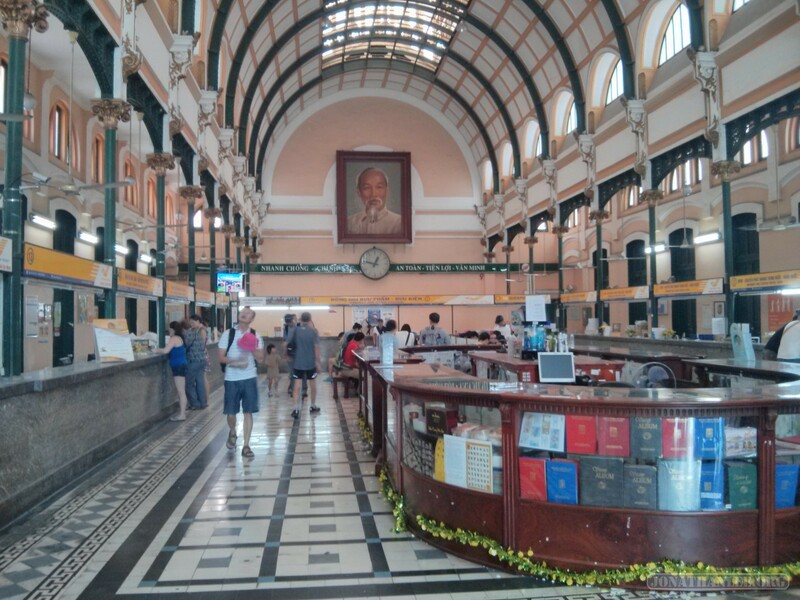 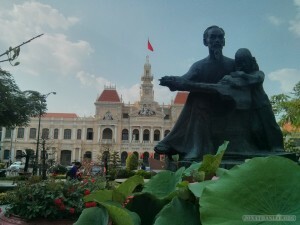 People Committee’s Hall: graced with a statue of Ho Chi Minh up front. 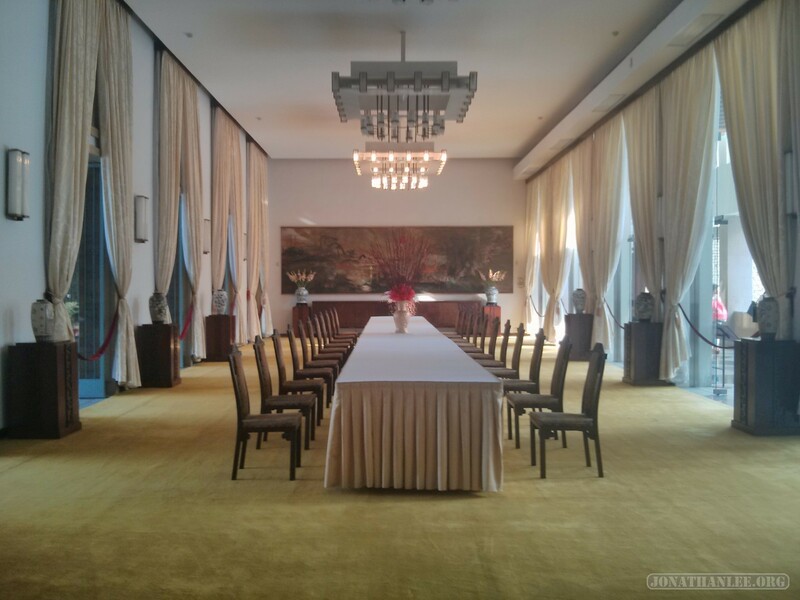 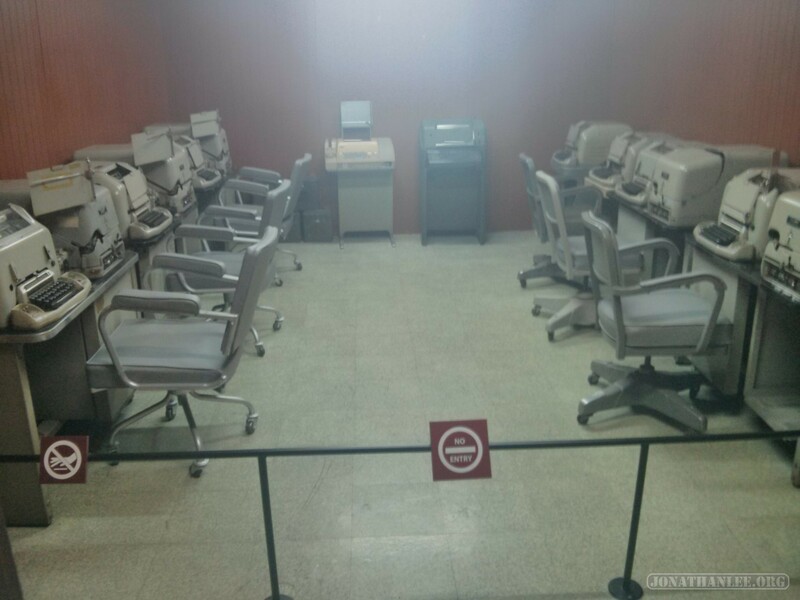 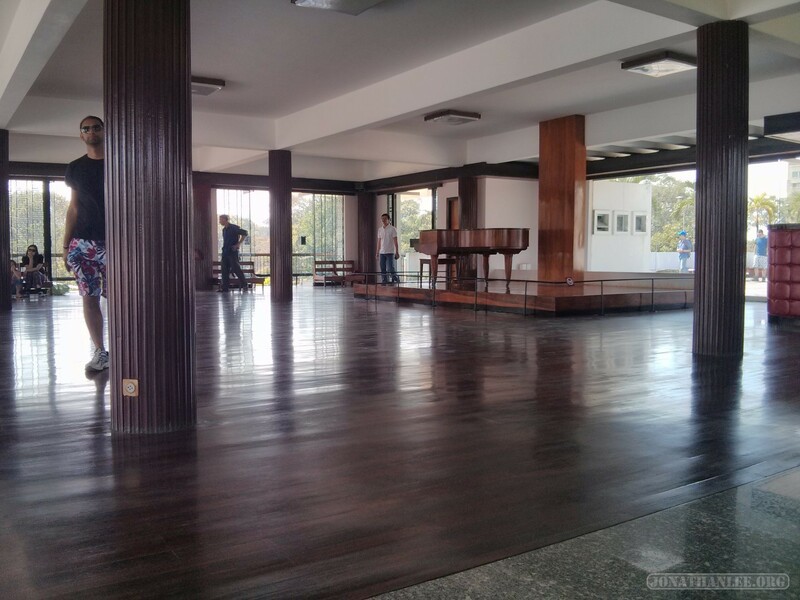 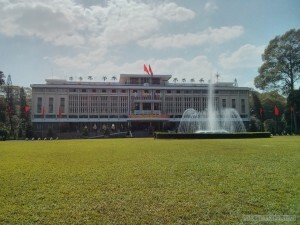 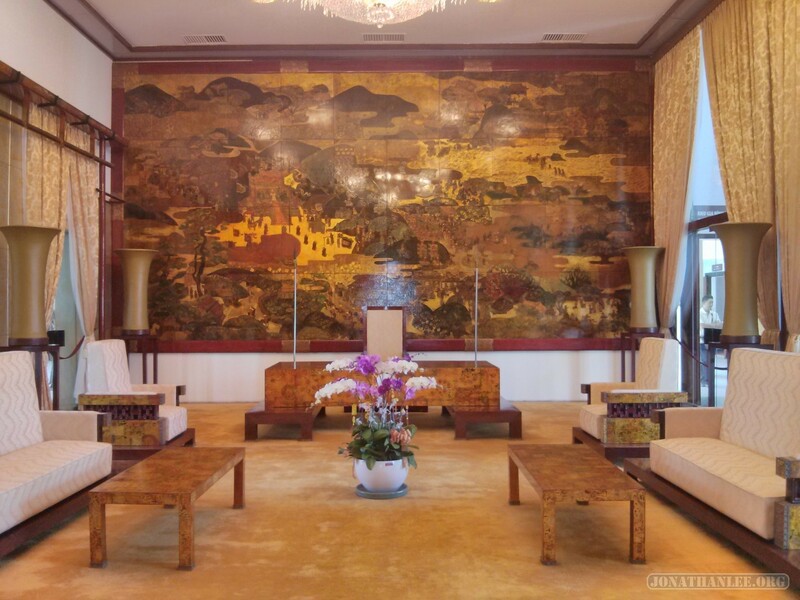 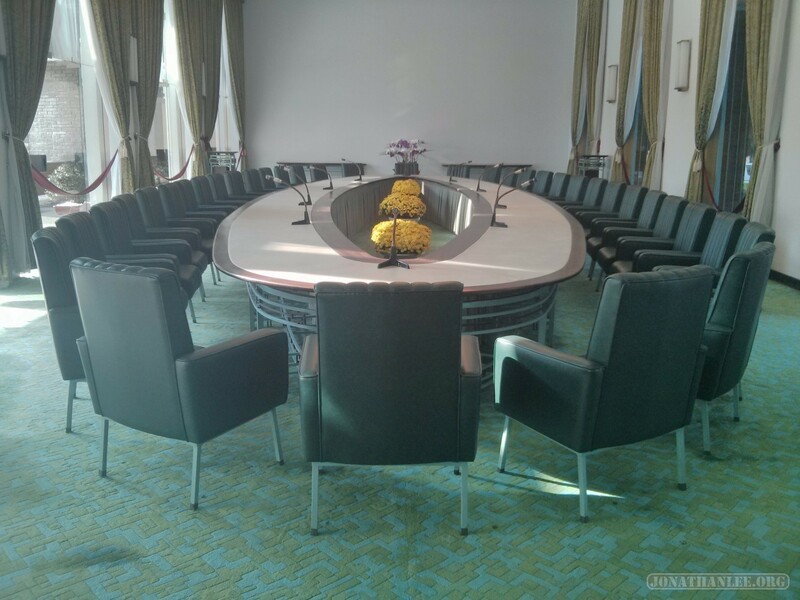 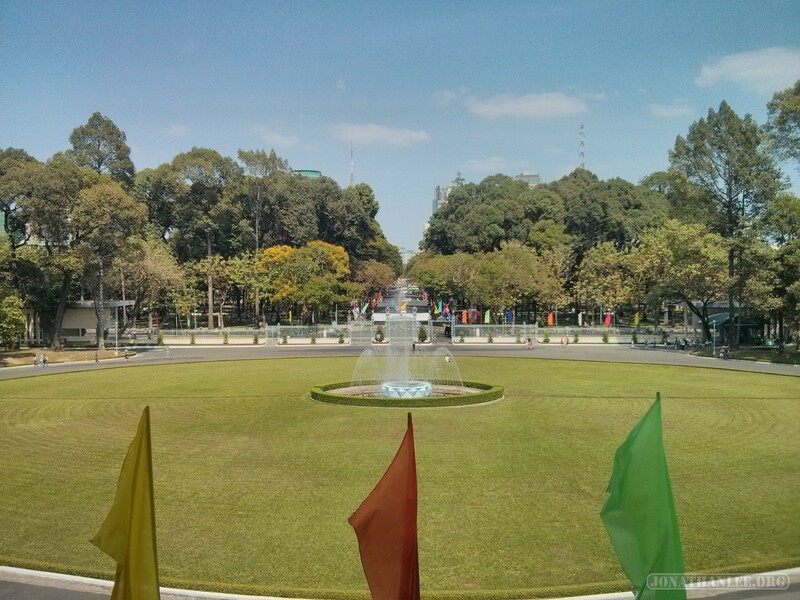 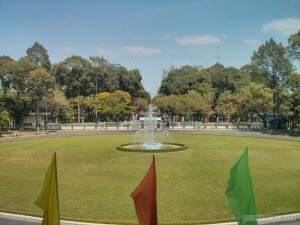 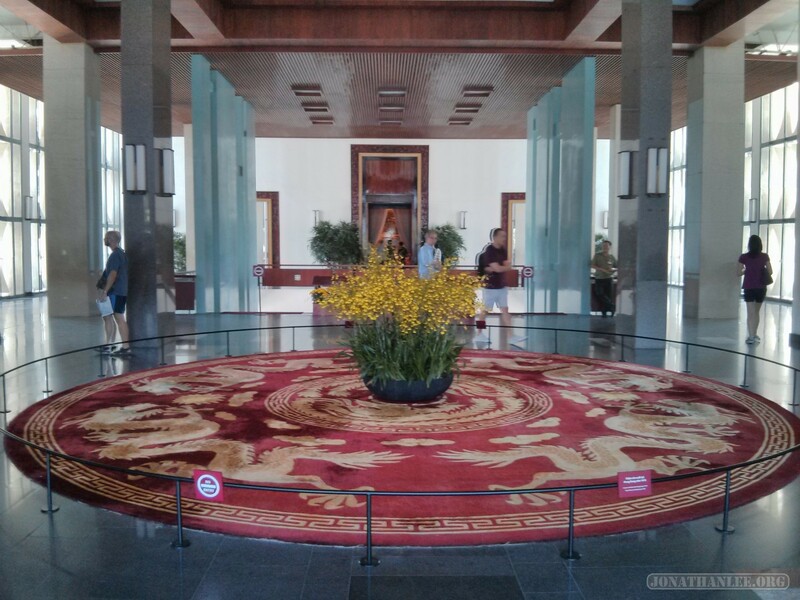 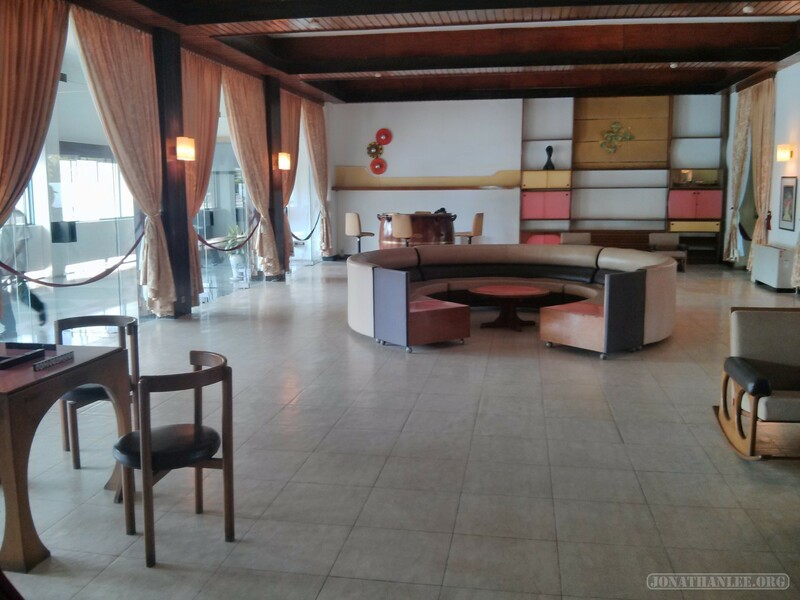 Reunification Palace: The former Independence Palace, home of the South Vietnamese president. 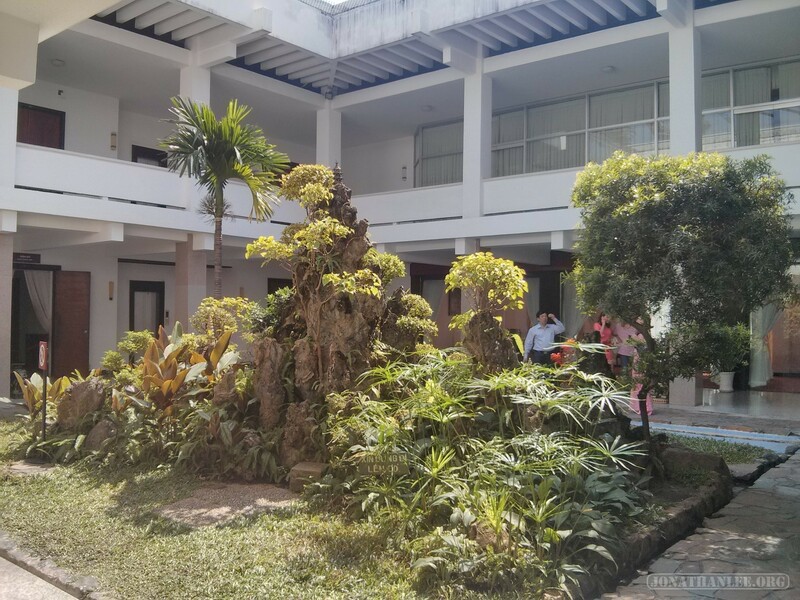 It’s a very nice place, very well designed, with lots of sunlight from large windows, a spacious feel, very zen. 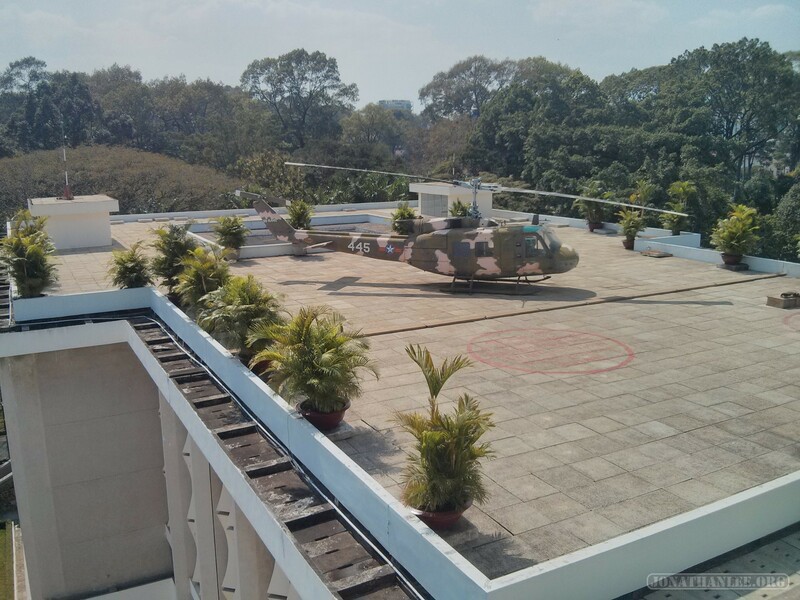 It’s got a library, game room, cinema, and even a rooftop meditation space converted into a rooftop party room – and helicopter pad! 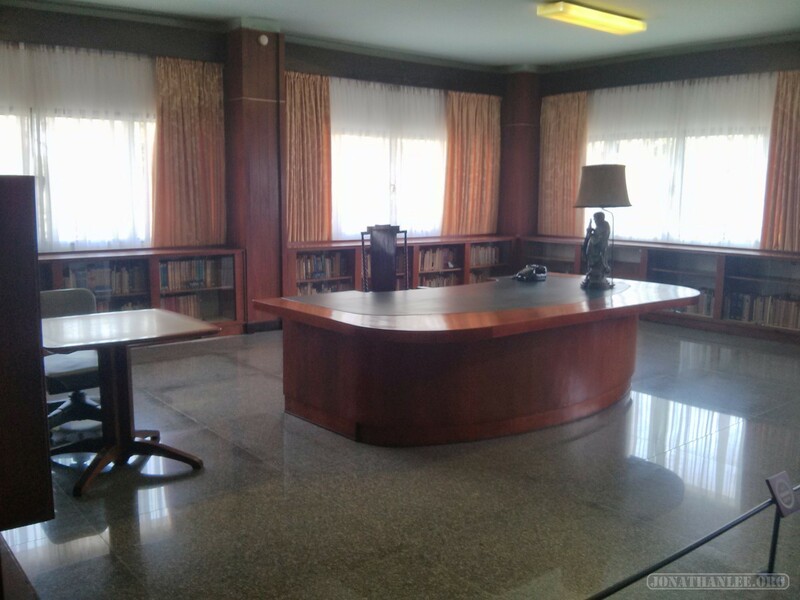 And it’s got an underground bunker, for planning the war effort! 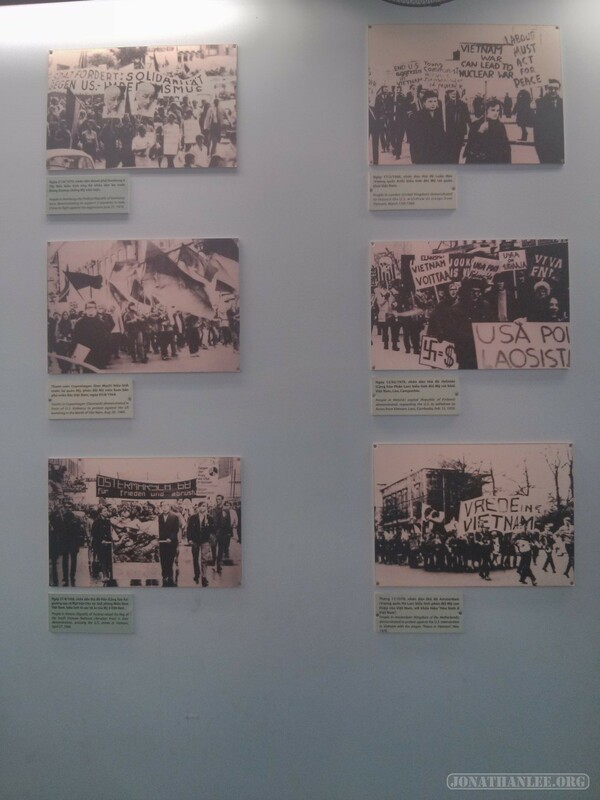 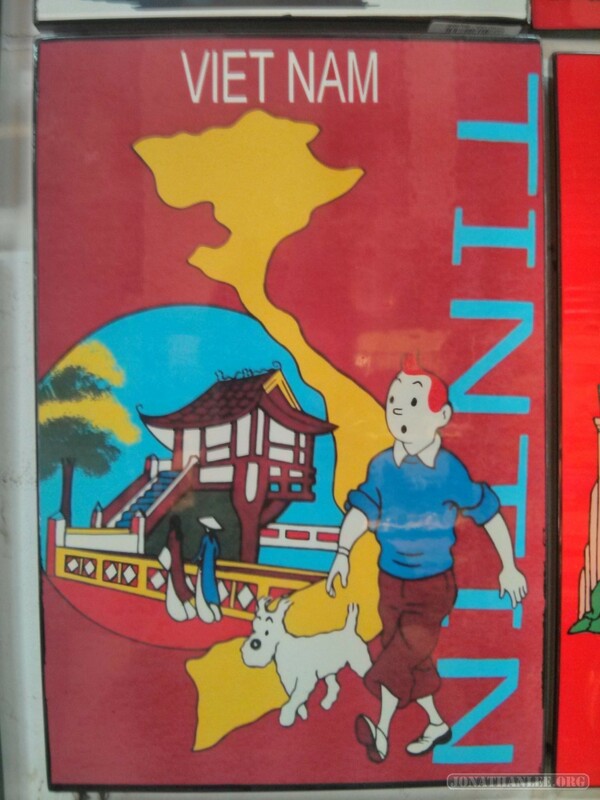 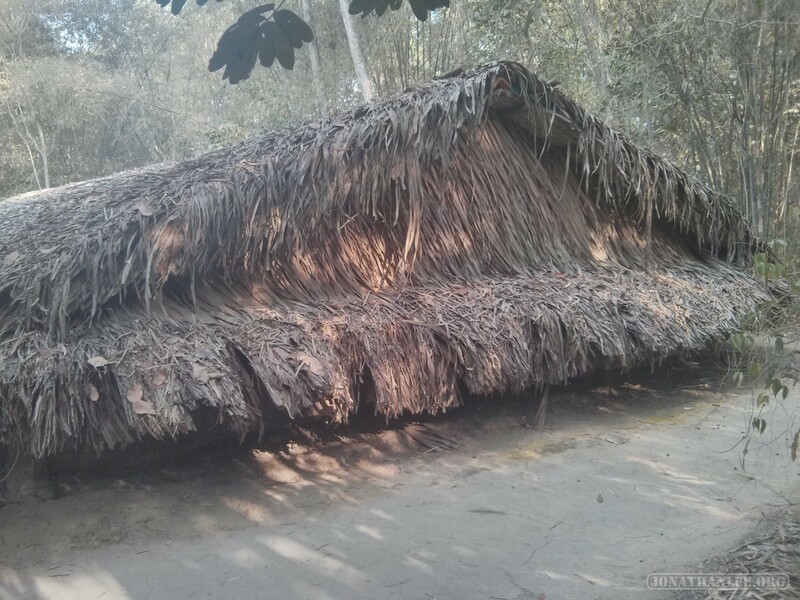 Museum of Vietnam History: unremarkable. 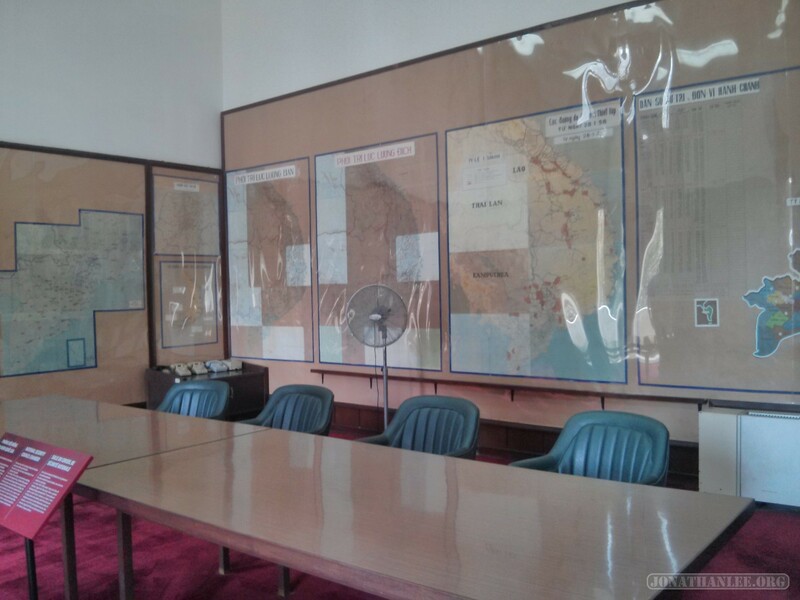 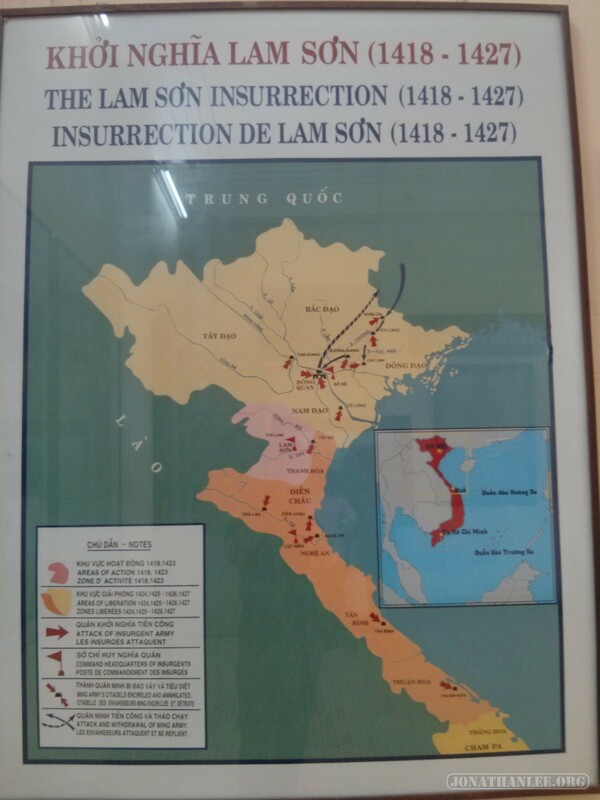 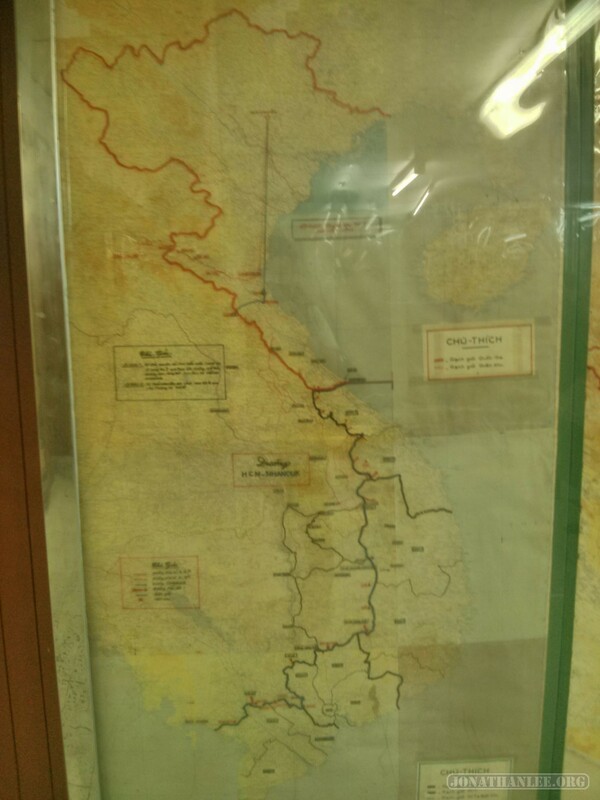 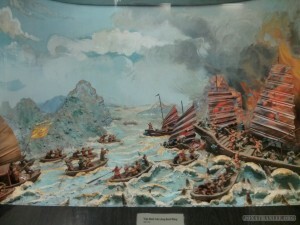 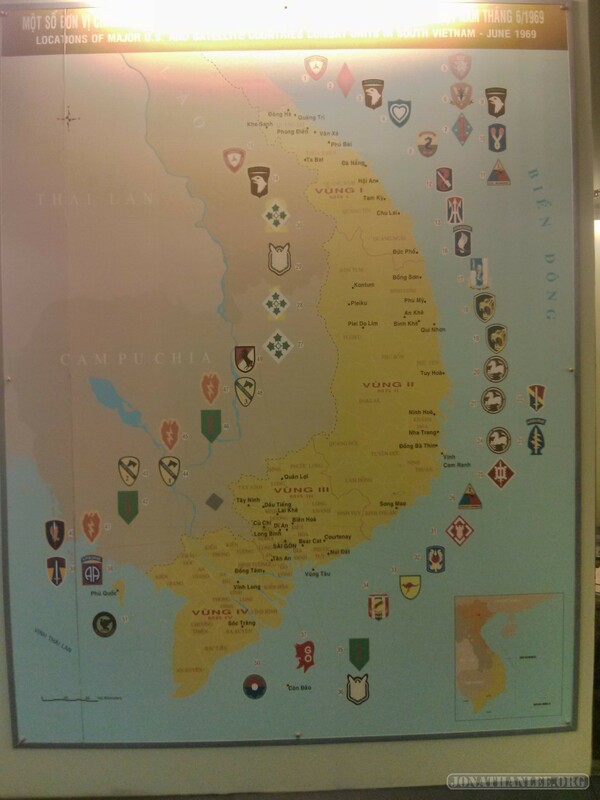 It’s primary draw is maps and displays of how Vietnam has resisted invasions from China, from the Mongols, and other armies. 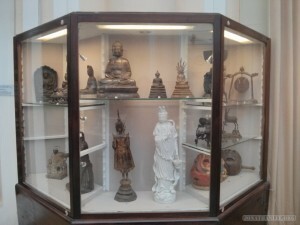 It spoke for a bit on the variety of themes in Buddha construction in southeast Asia – the gentility of Buddha construction in China, the refinement of Thailand, the perfection of Japan, the meditation of Cambodia, and the affection of Vietnam. 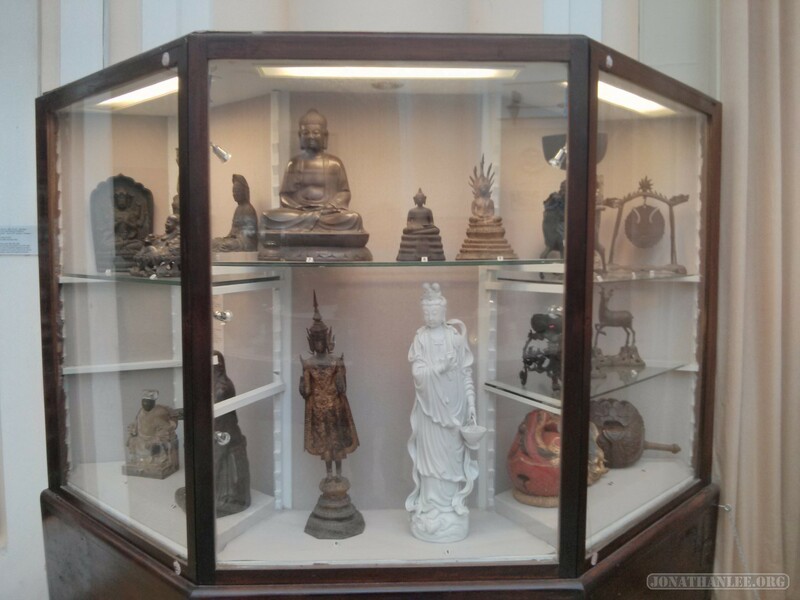 Other than that, the museum had a huge collection of miscellaneous (and boring) statues. Opera House: closed for Tet. 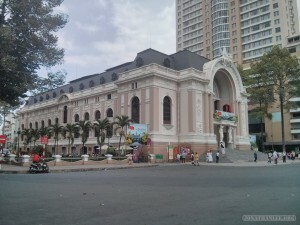 Supposedly, they have a very nice A O show that rivals Cirque du Soleil. 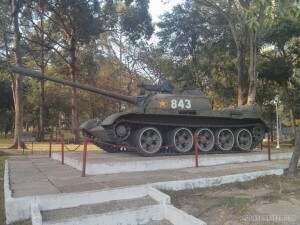 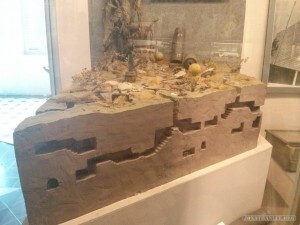 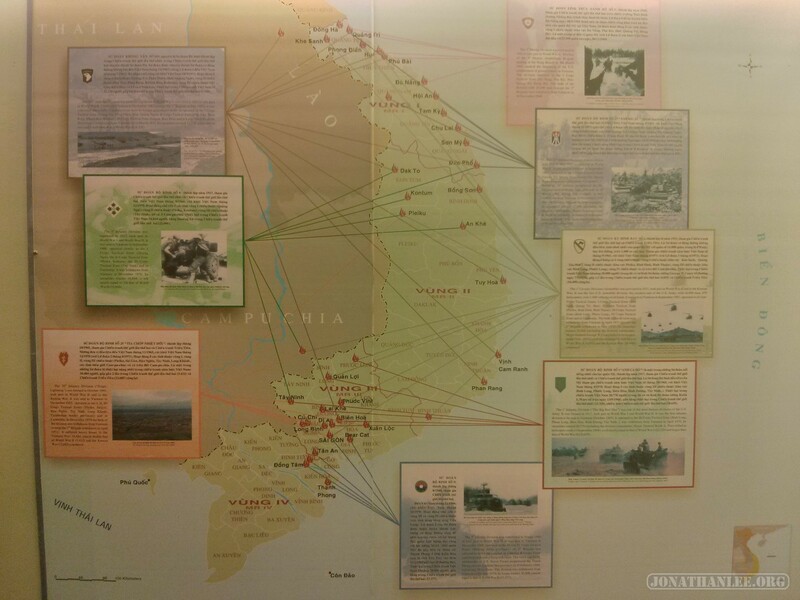 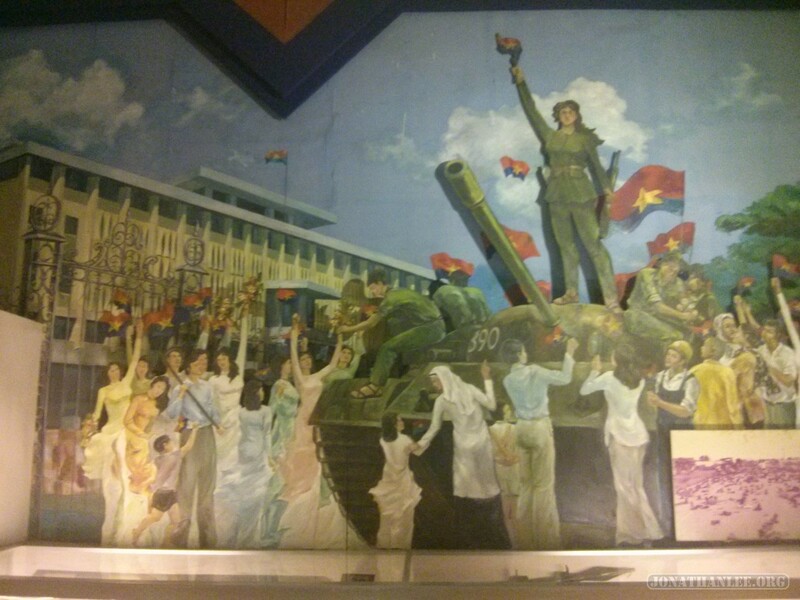 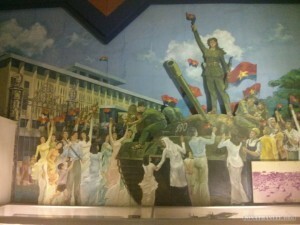 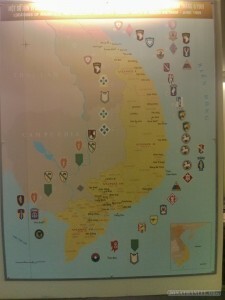 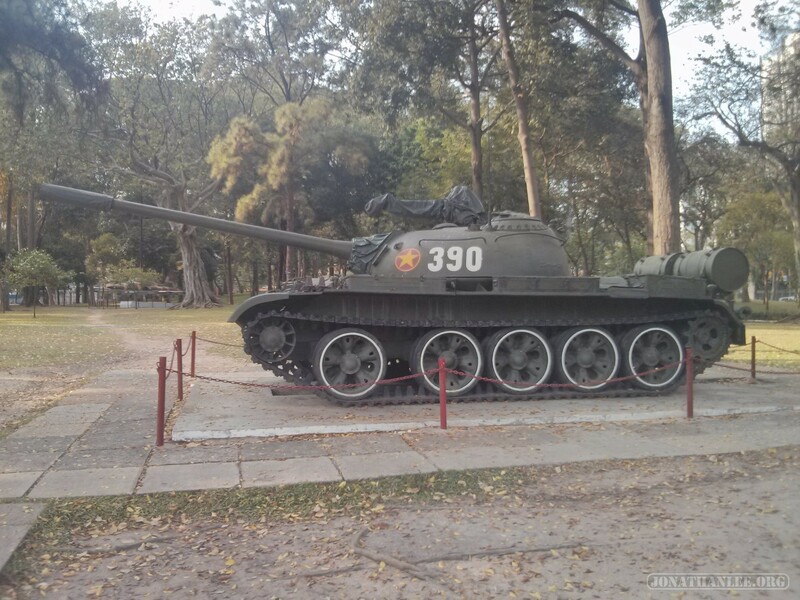 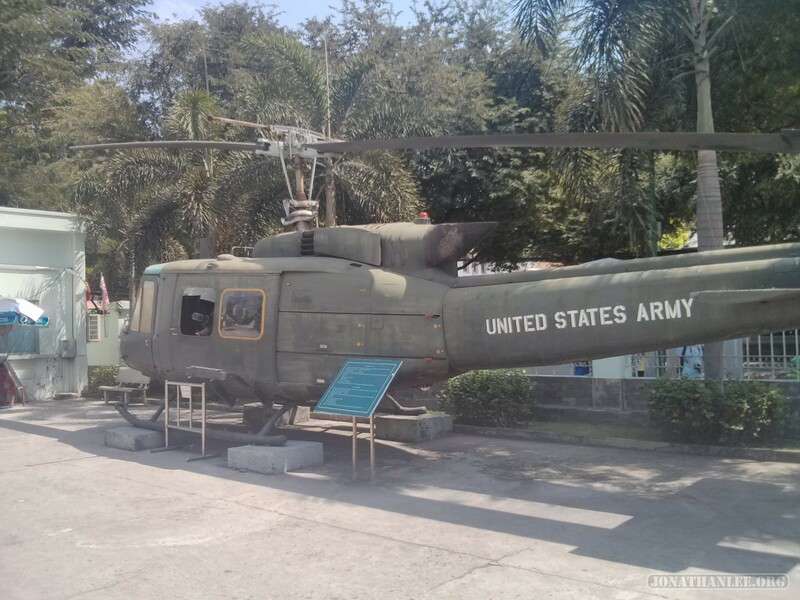 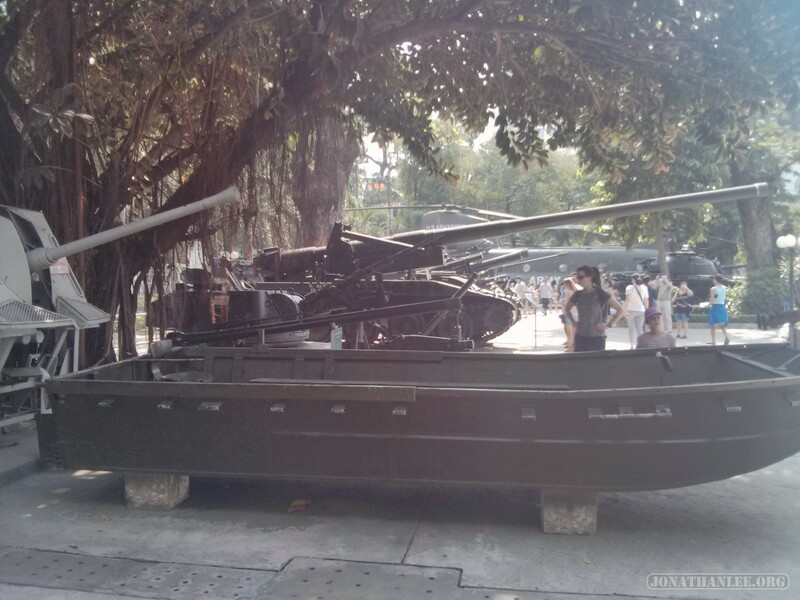 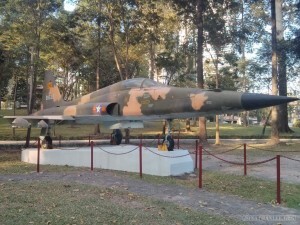 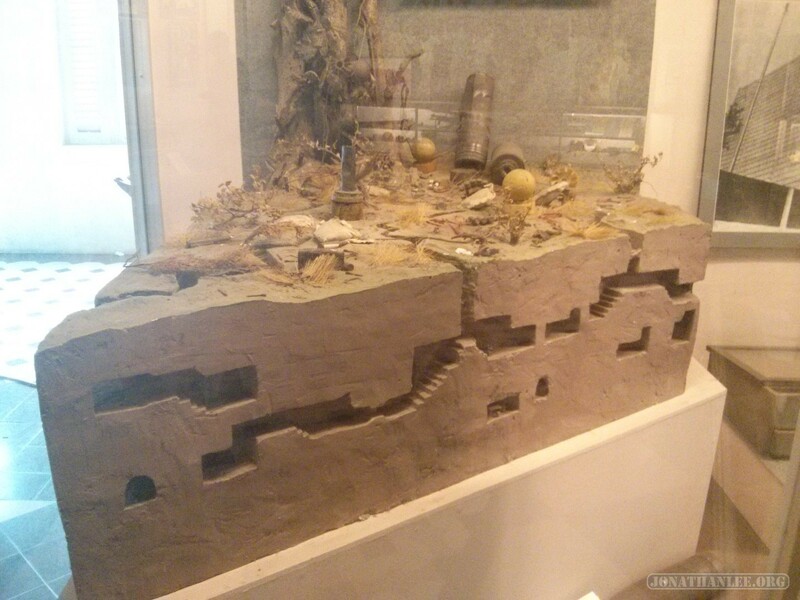 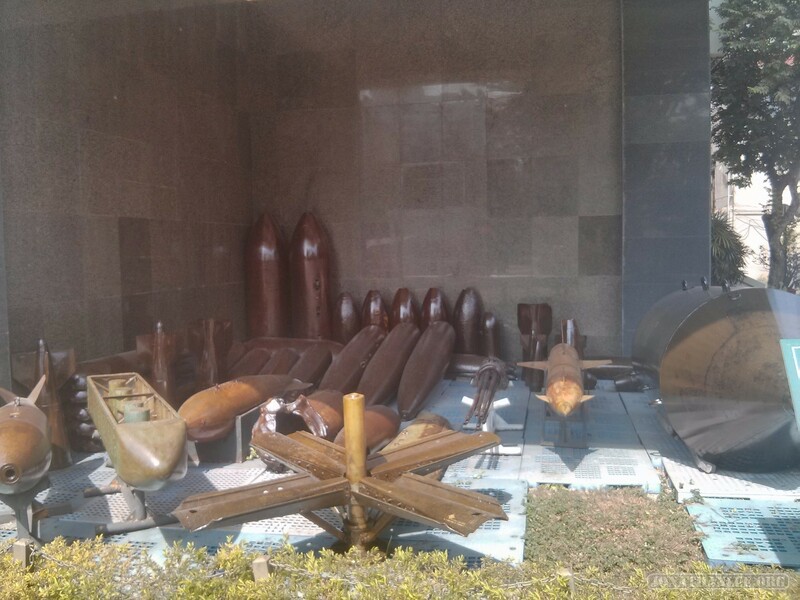 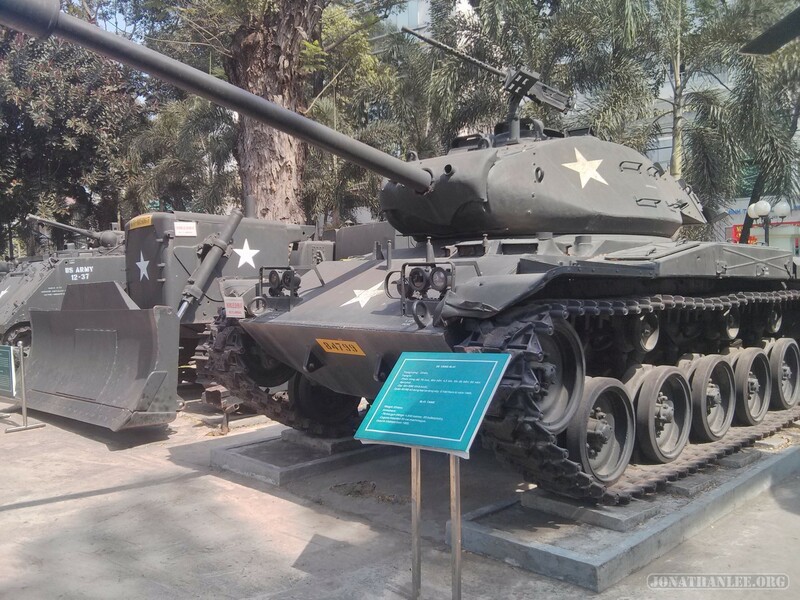 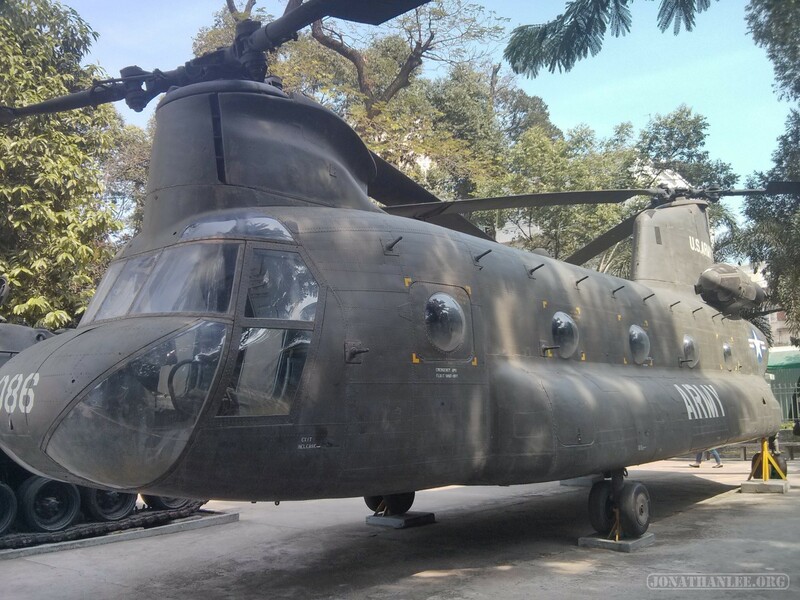 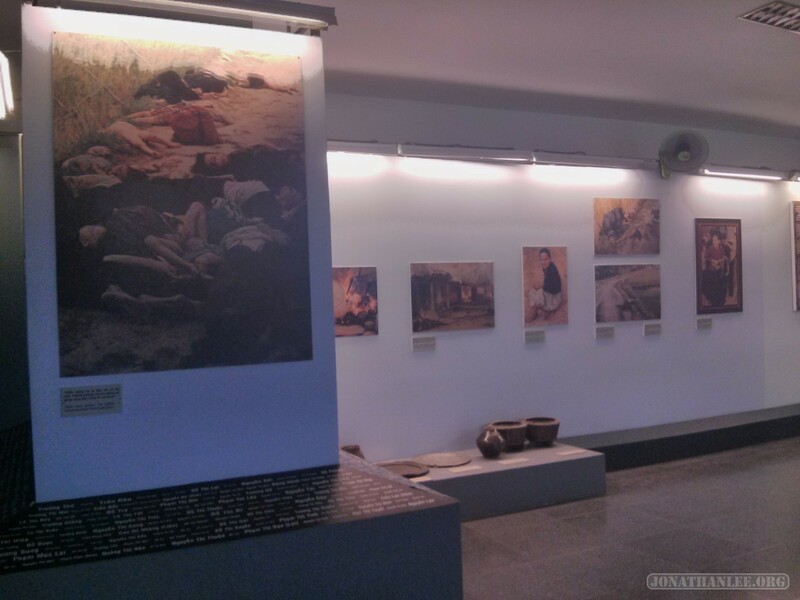 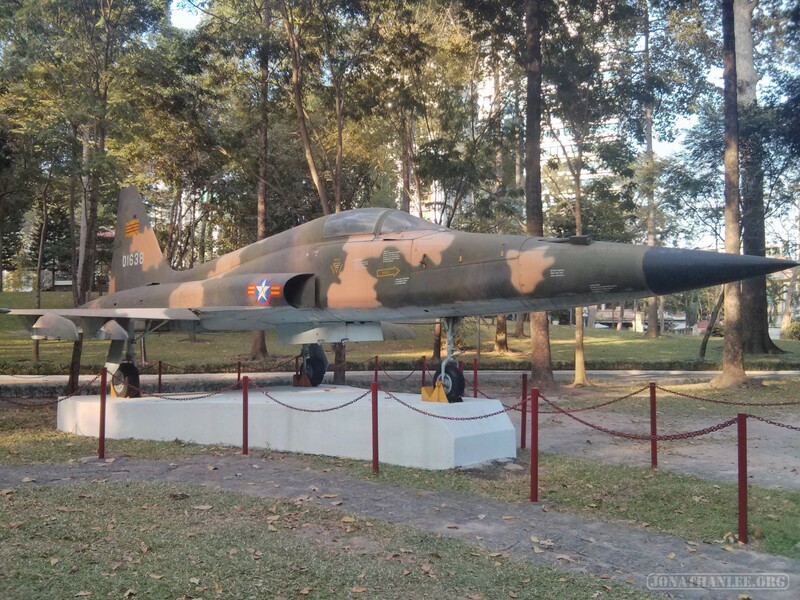 War Remnants Museum: a really cool (though heavily biased) museum, it shows artifacts from the Vietnam War. 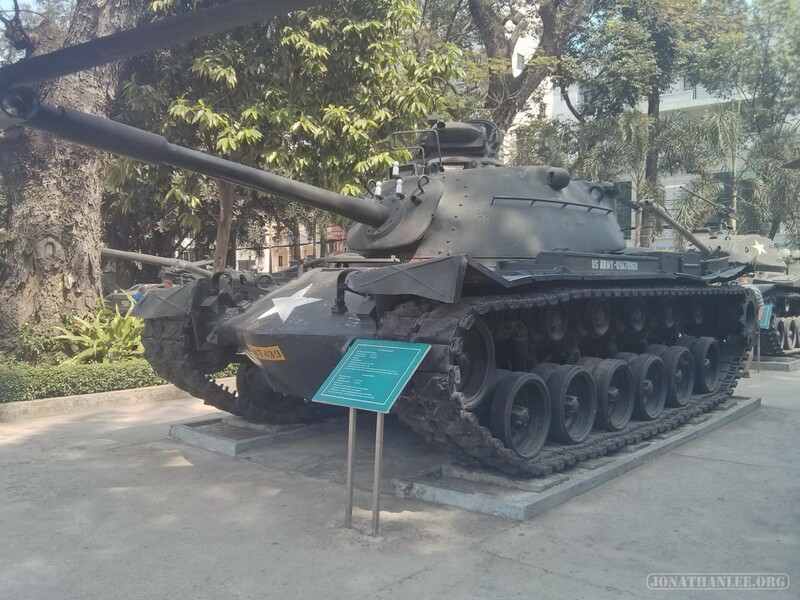 – American forces used all sorts of heavy weaponry (against the poor Vietnamese peasants). 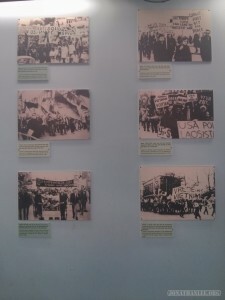 – The entire world protested against the US’s imperialistic invasion of Vietnam (by Communist associations around the world). 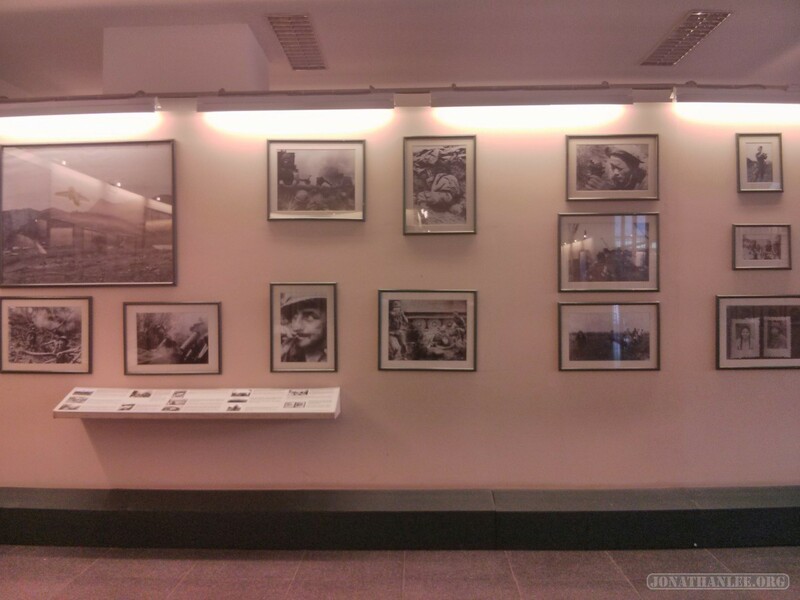 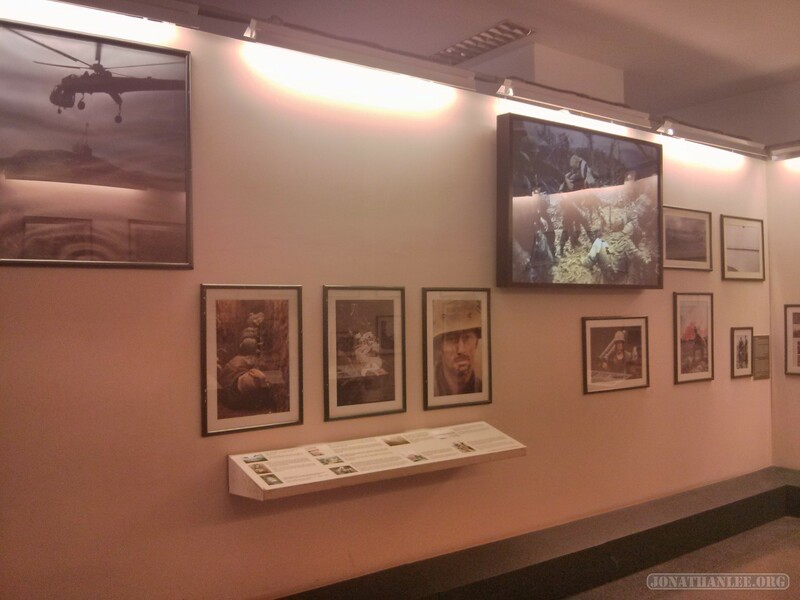 – A whole ton of photographs, showing the beauty of Vietnam and the cruelty of US forces. 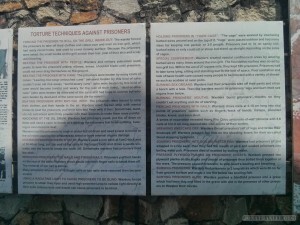 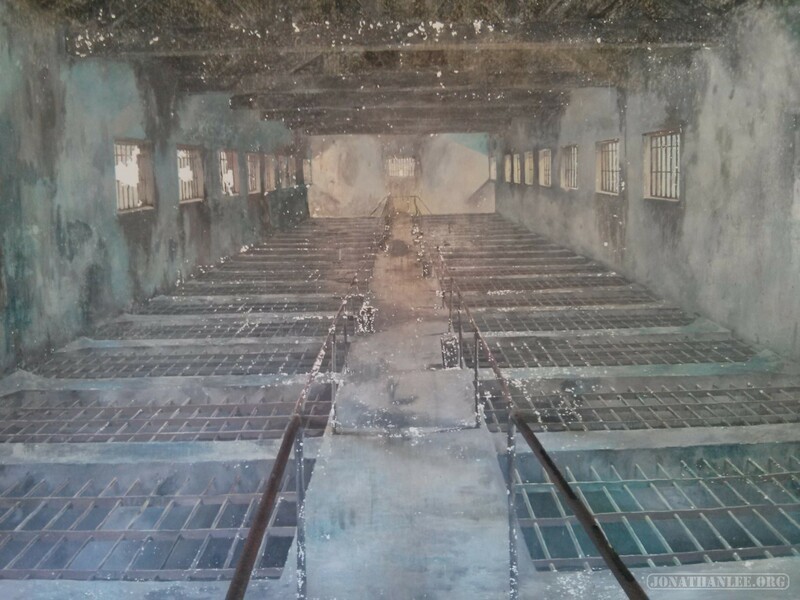 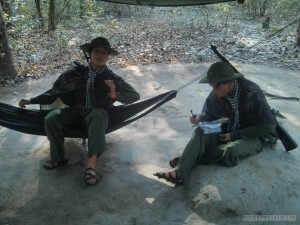 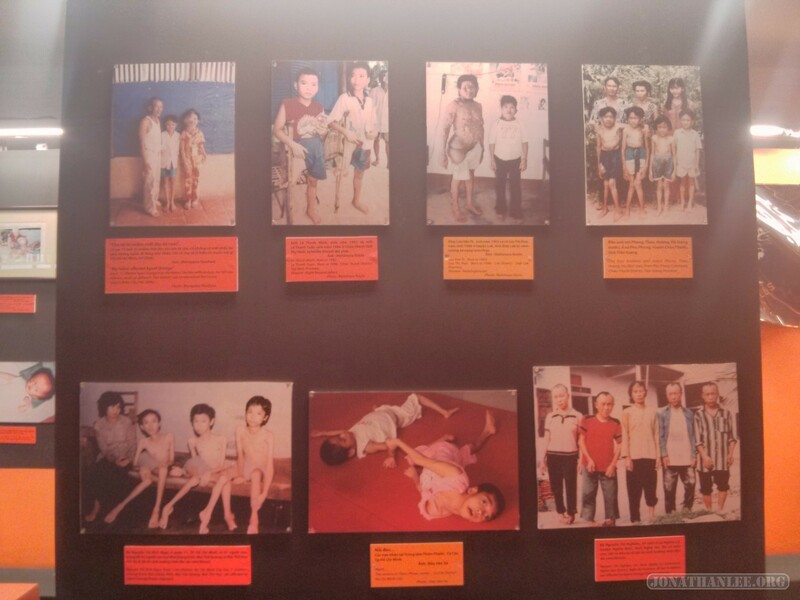 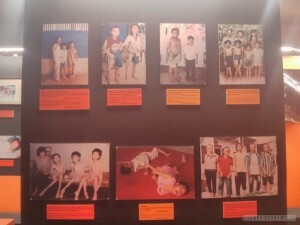 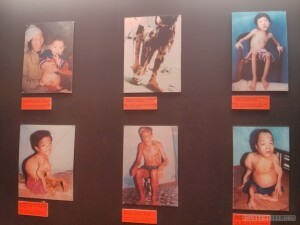 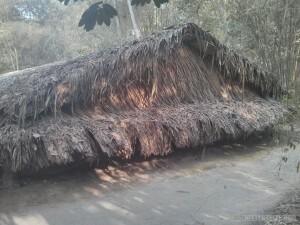 – ‘Tiger cage’ prisons and torture techniques used against Vietcong freedom fighters. 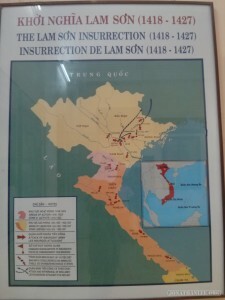 – Major battles where the Vietnamese liberation army defeated the invading US forces, in spite of the huge number of invading battalions in Vietnam. 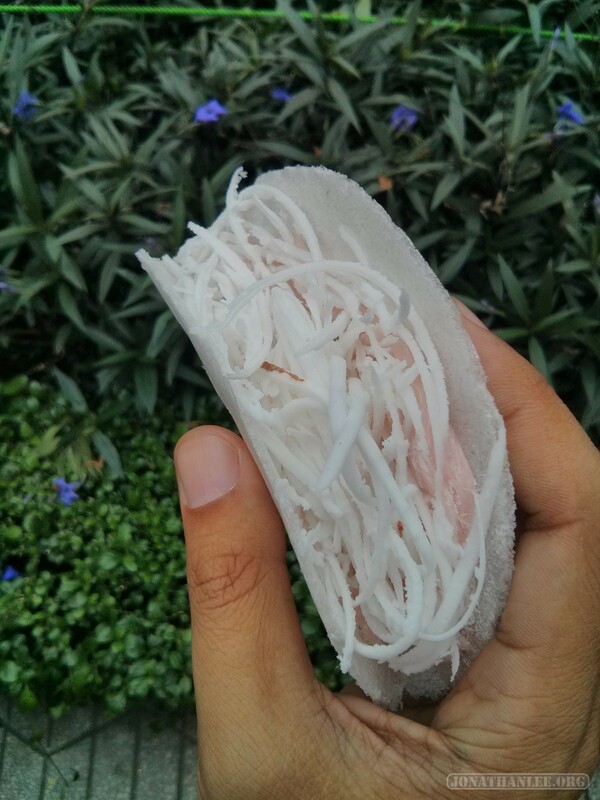 – This is a Vietnamese taco. It is delicious. 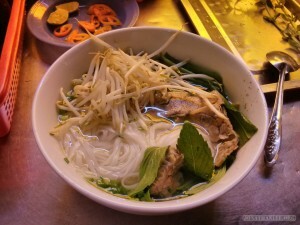 – Pho! 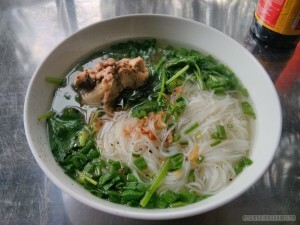 Compared to the USA, portion sizes are quite small. 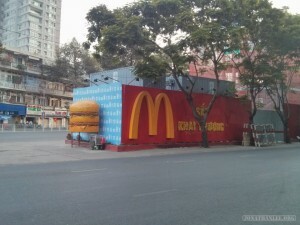 – During my stay in Vietnam, the first McDonalds to open in Vietnam, opened in Saigon. I’ve got mixed feelings. 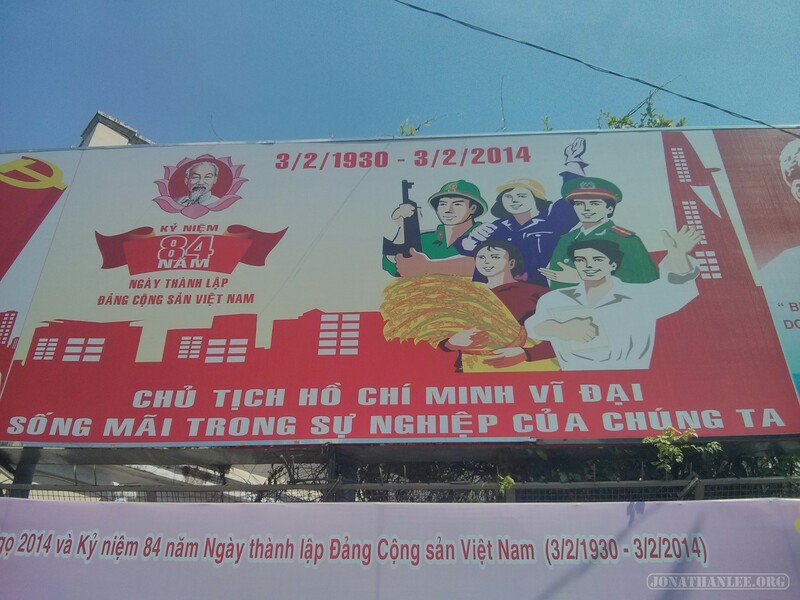 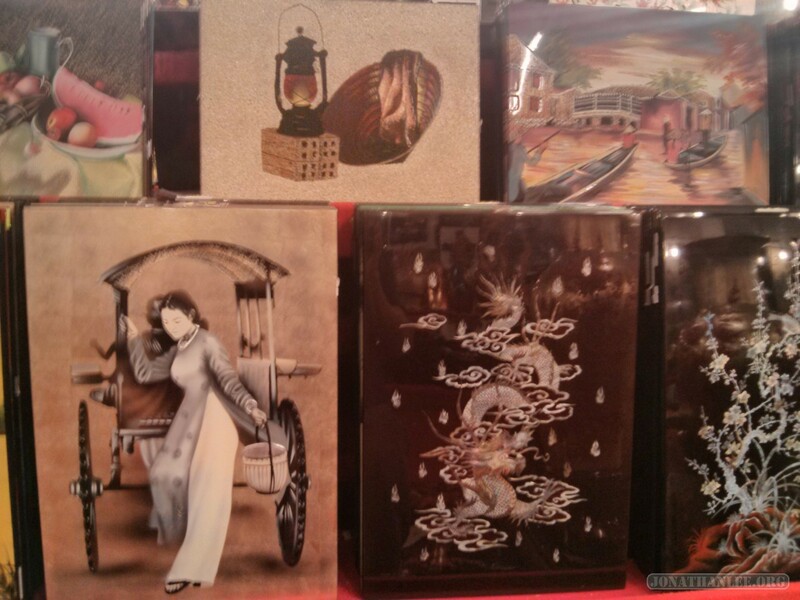 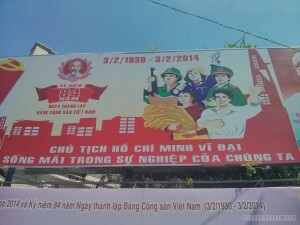 On one hand, this globalization is going to contribute towards the destruction of Vietnamese culture. 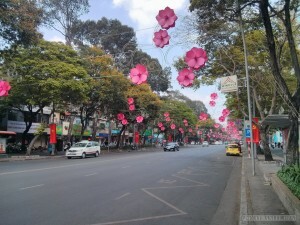 At the same time, doesn’t Vietnam have the right to join the global market, increase its wealth? – Model ship shop! 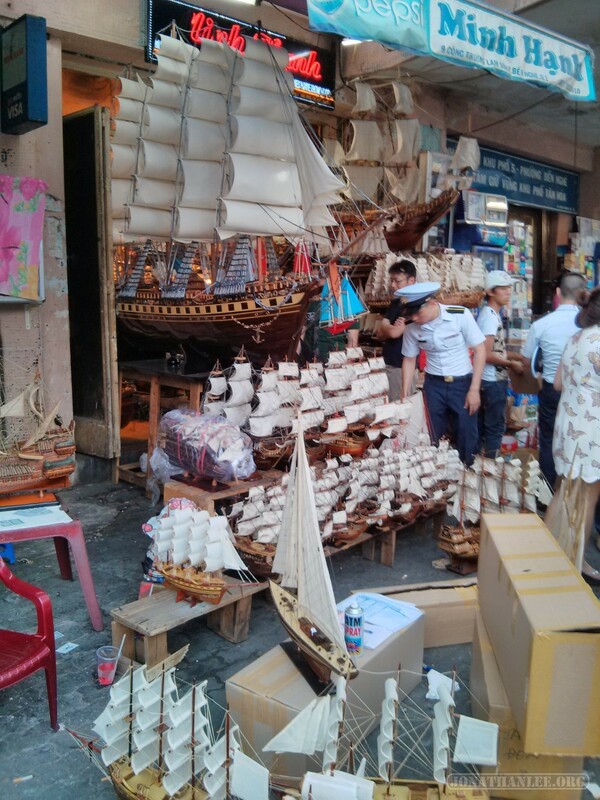 It should be obvious, but I found it interesting that even in Vietnam, there are specialty hobby shops. 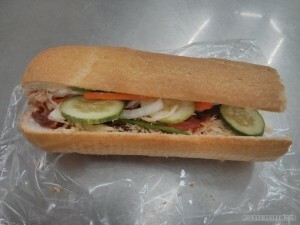 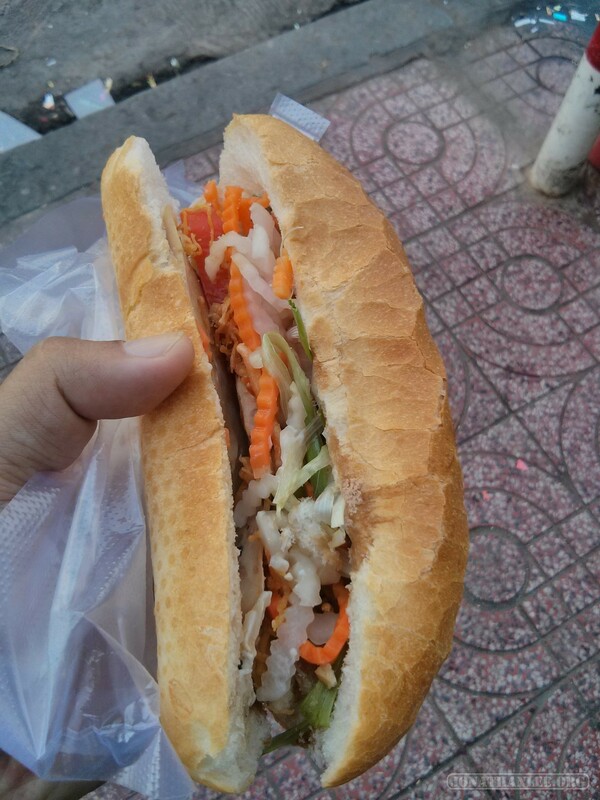 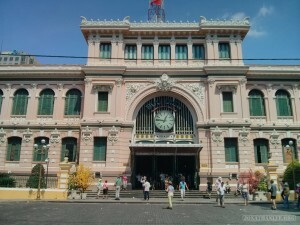 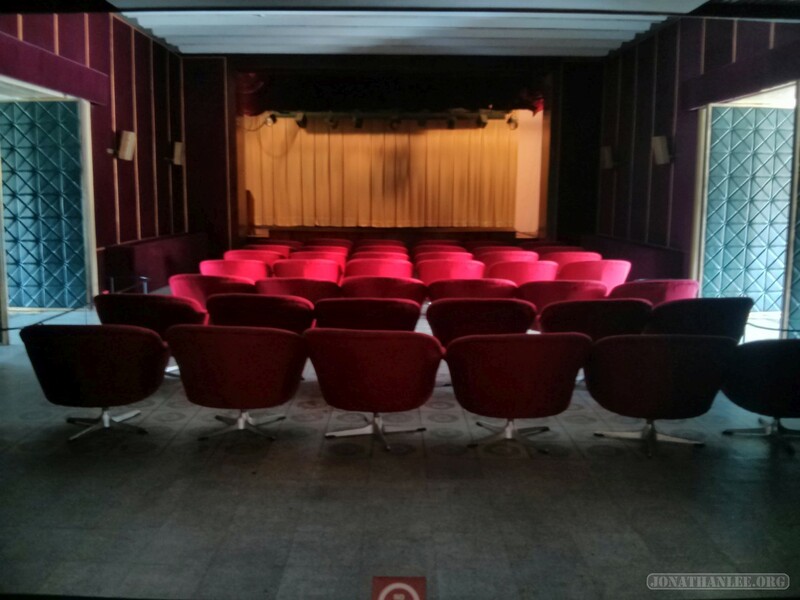 – Bui Vien, the backpacker central bar street. 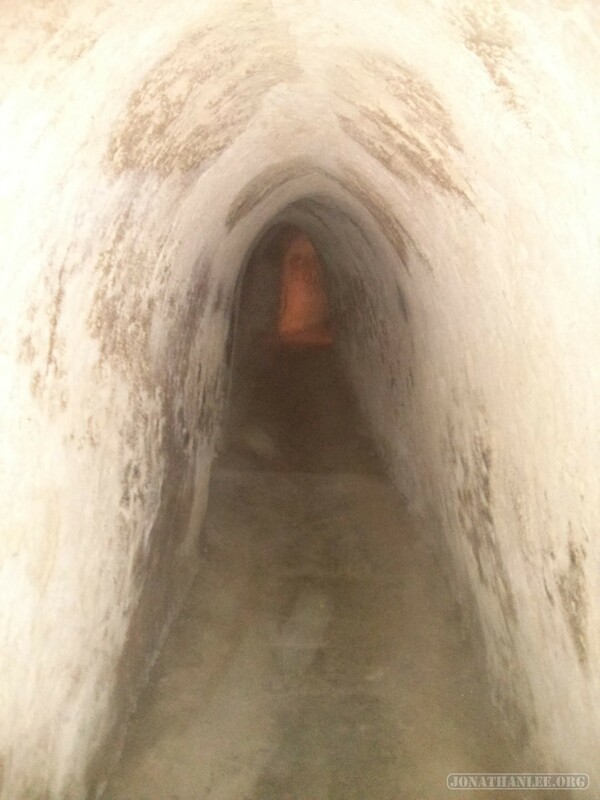 I stayed away as much as possible. 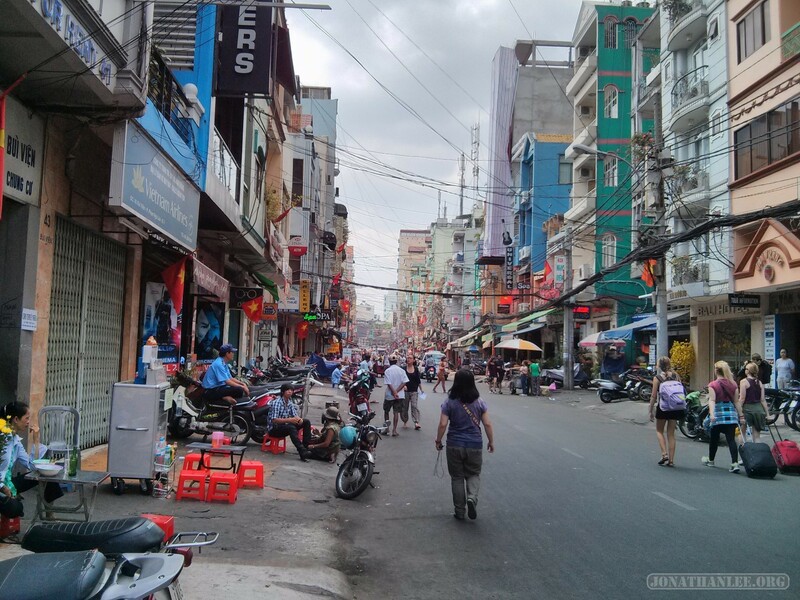 At night, instead of drinking in proper bars, random bars just open up on the street – plastic chairs are put out on the curb, where you just sit down and dream very cheap beers. 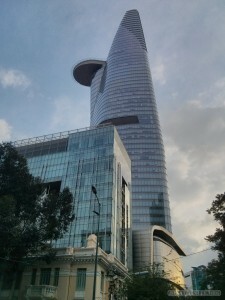 – Bitexco, the financial building, dominates the Saigon skyline. 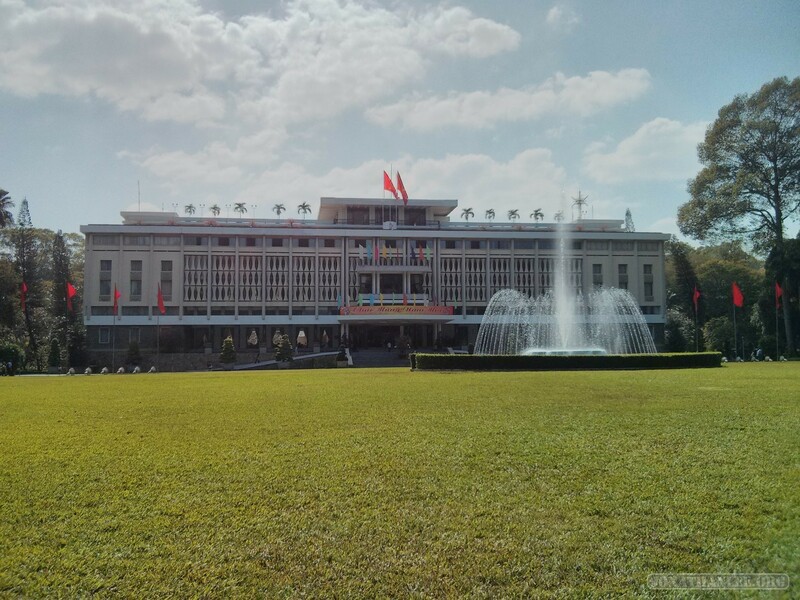 It’s always a finance building.